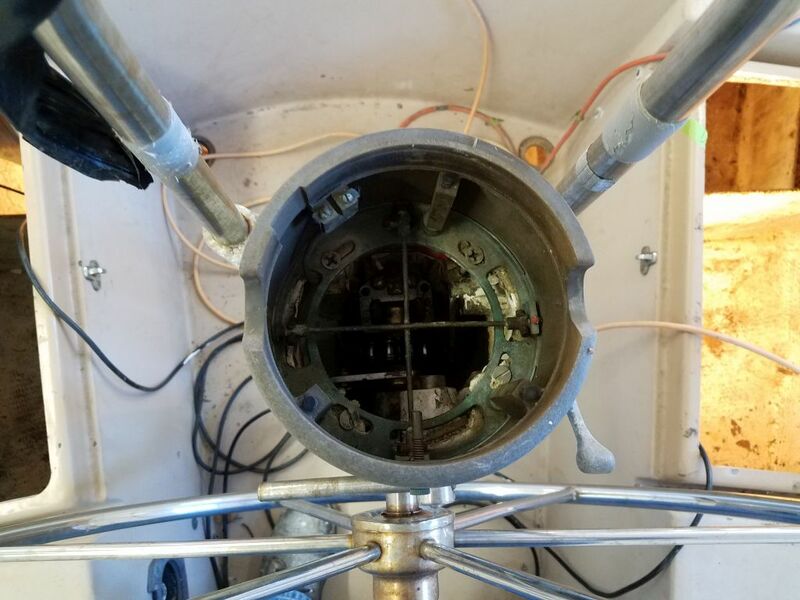 Hoping to disassemble the top part of the steering pedestal, I removed the compass to expose the innards. 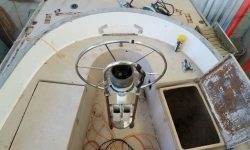 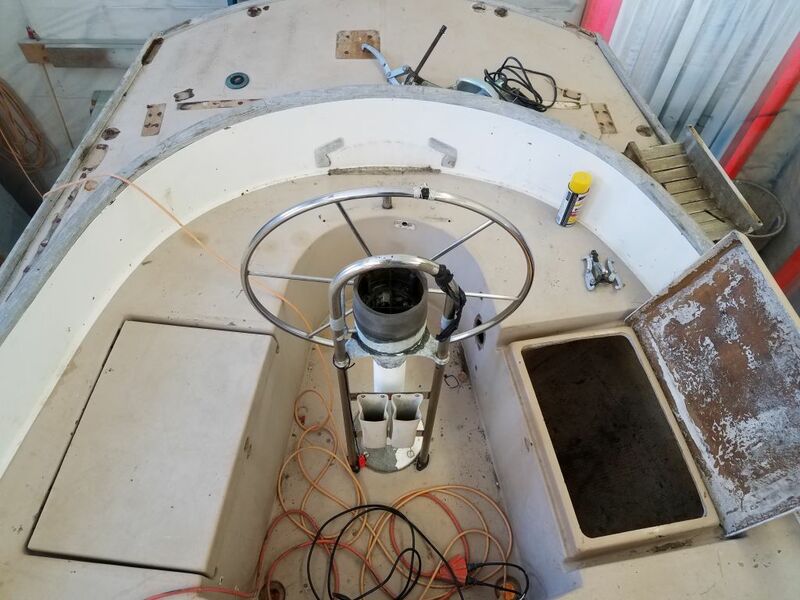 The long screws securing the compass binnacle to the top of the pedestal–stainless steel into aluminum–were heavily stuck in place with corrosion and I couldn’t budge them, so I soaked them in penetrating oil for the moment. 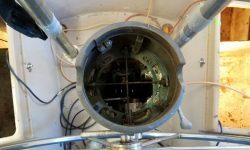 Meanwhile, I failed yet again to pull the wheel off the shaft despite massive pressure on the gear pulling tool. 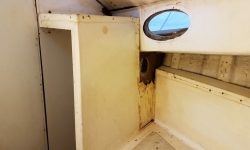 I abandoned the disassembly for now and, while I was in the cockpit, removed a few last bits of hardware from the cockpit well, including the locker latches, the old manual bilge pump, and the engine stop cable. 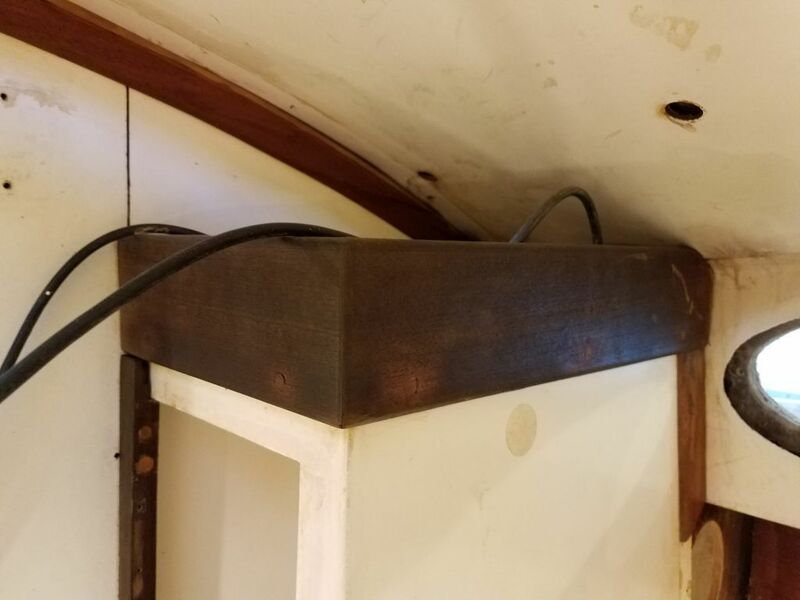 Since I now knew the pedestal wouldn’t be reused or require more work from me, I abandoned the disassembly and planned to soon remove the pedestal entirely from beneath. 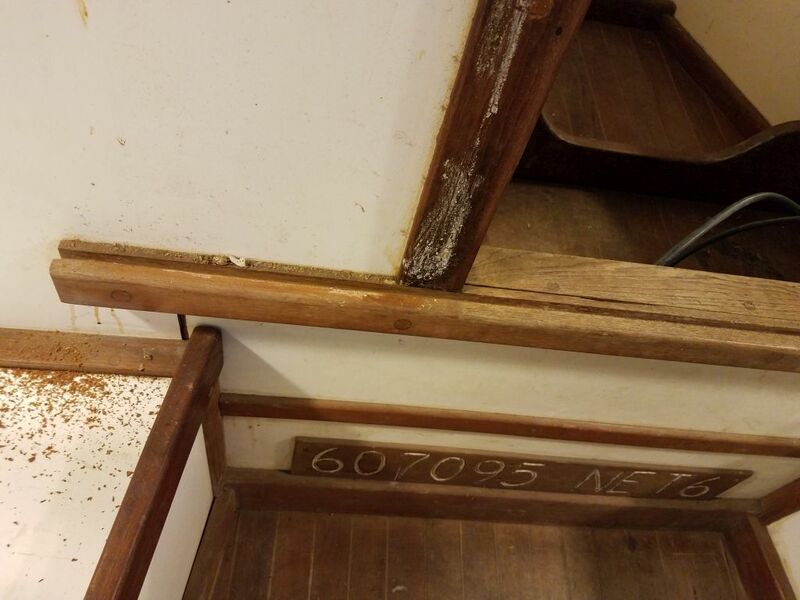 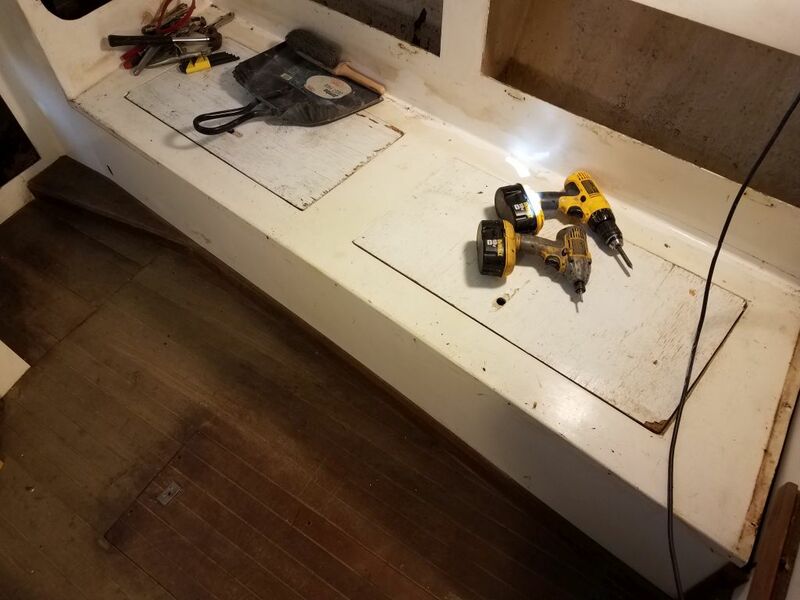 In the meantime, I got back to work in the cabin removing the rest of the trim. 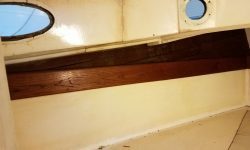 I discussed the condition of the trim with the owner, and he agreed that since much of the old teak was dark, stained, and dirty, as well as damaged in several places and generally nothing special to begin with, it made sense going forward to consider replacing the trim with a new wood of his choice rather than expend extensive effort carefully saving each piece of trim in the boat, then refinishing and reinstalling it all. 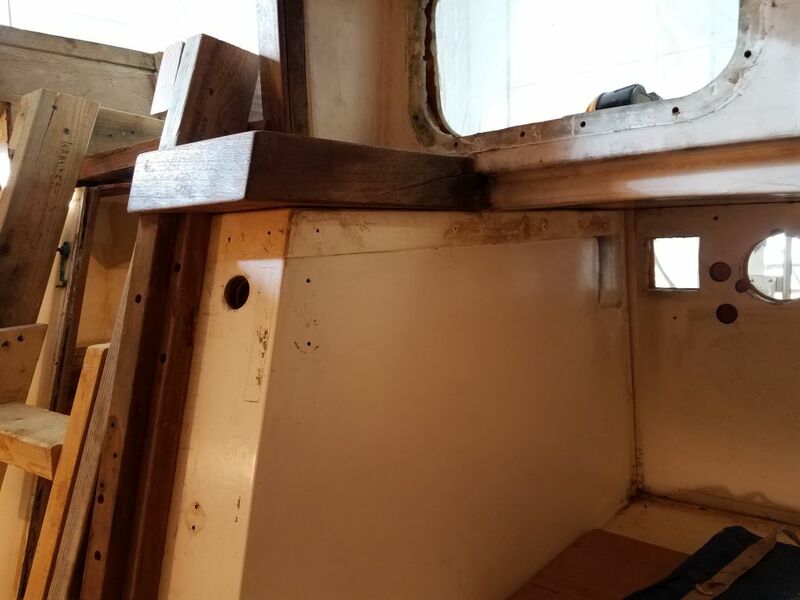 While I planned to save any trim pieces that were worthwhile for another use, many of the small, thin pieces would require more effort to remove than to replace, and this streamlined the dismantling of the interior since I didn’t have to spend a lot of time on great care. 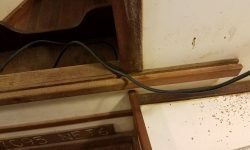 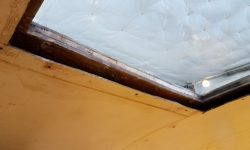 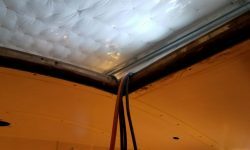 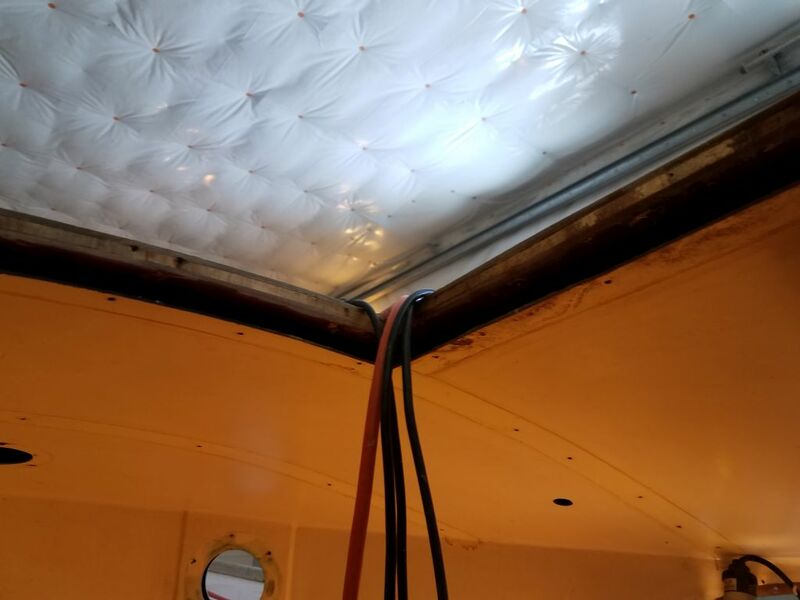 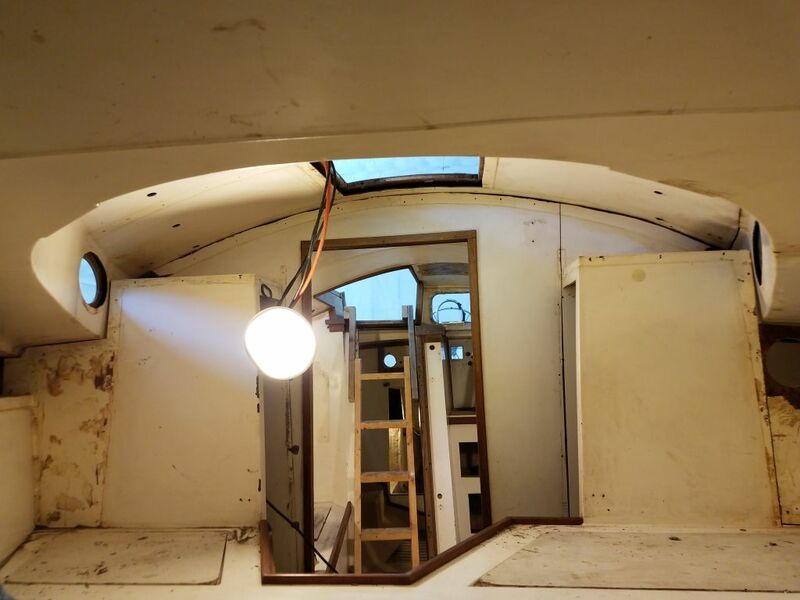 Beginning in the forward cabin, I removed the large fiddles around the edges of the berth, then removed the ceiling strips from the hull, a laborious process with many screws. 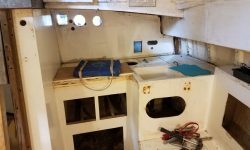 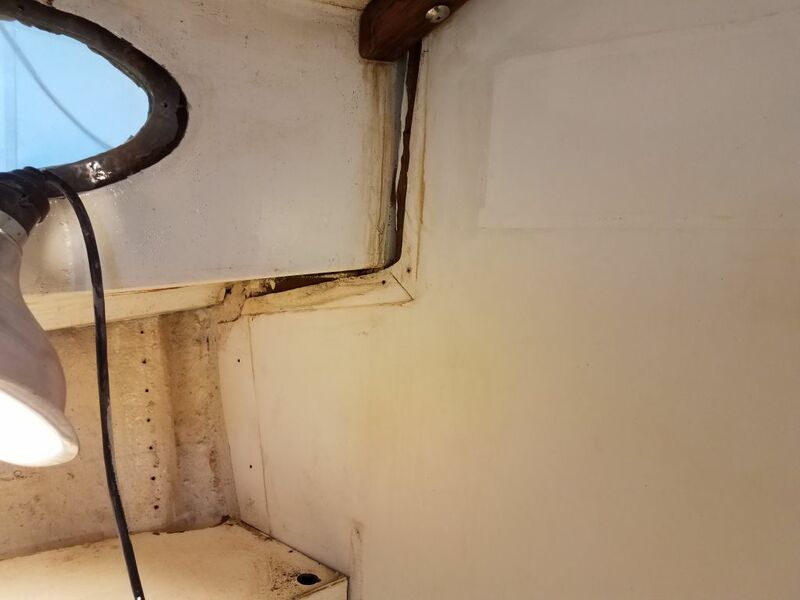 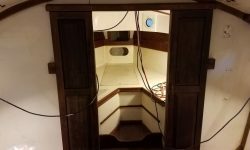 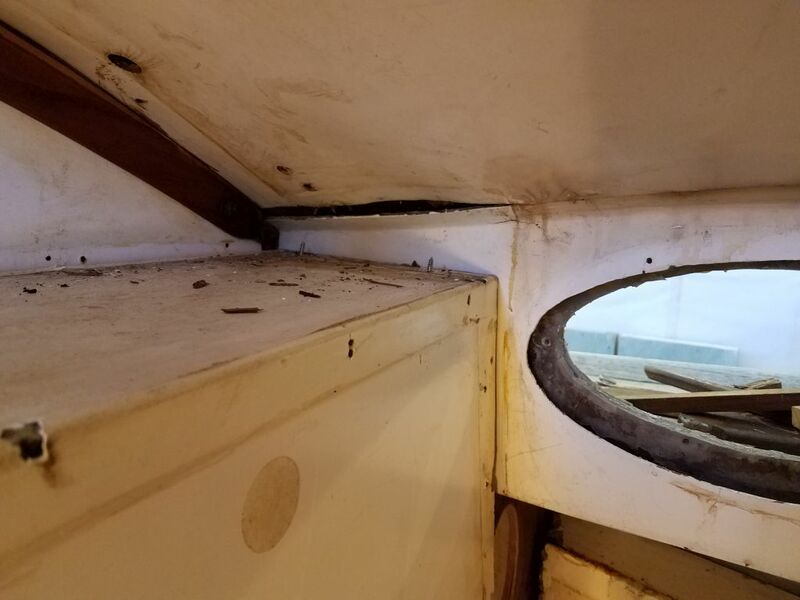 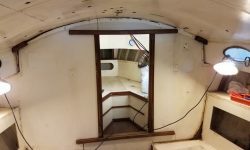 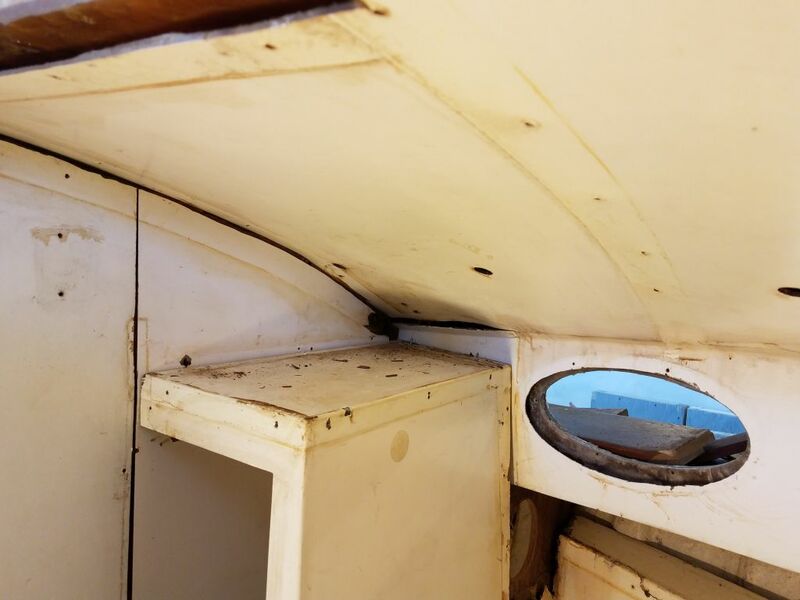 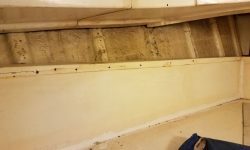 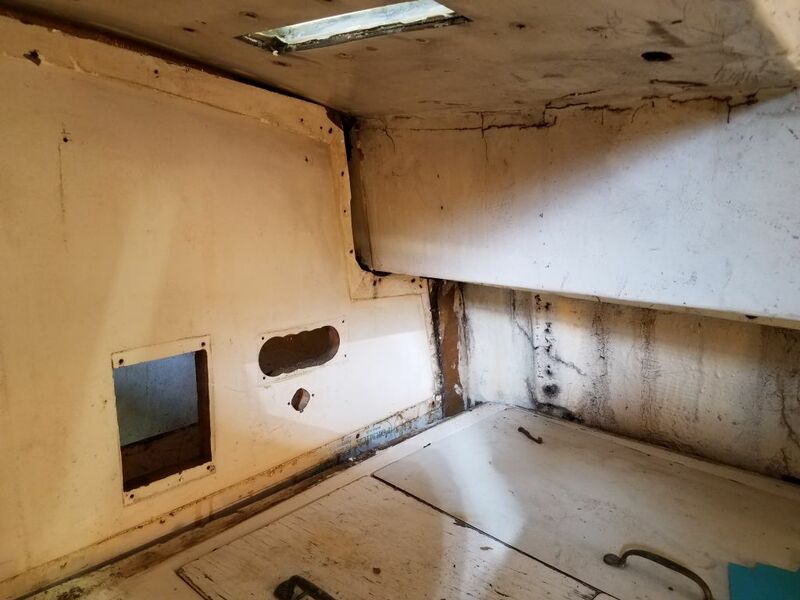 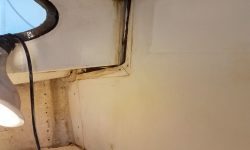 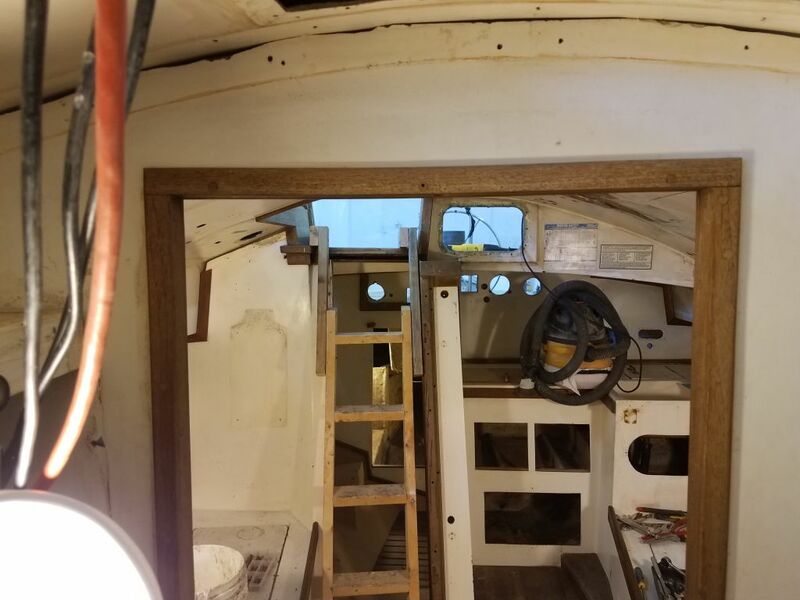 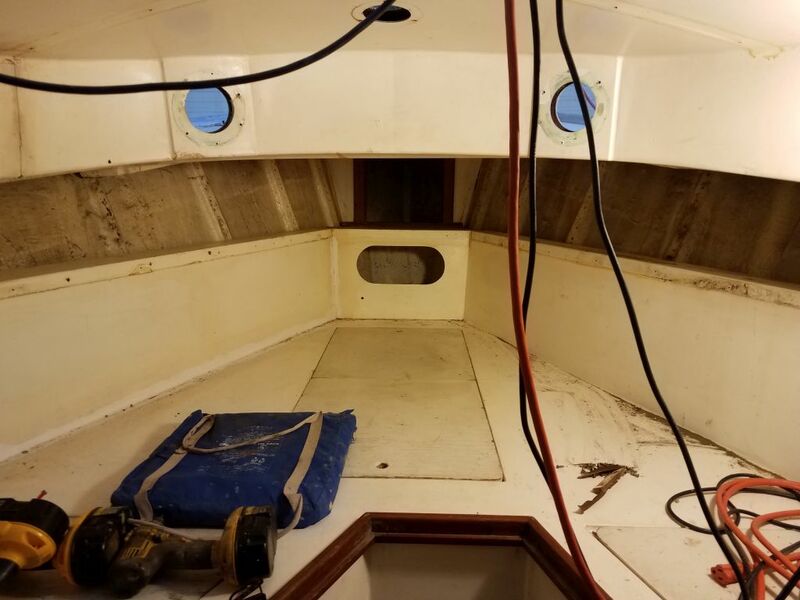 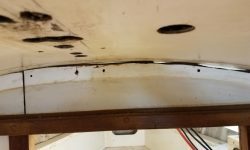 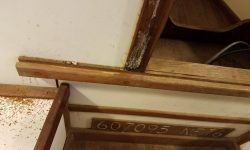 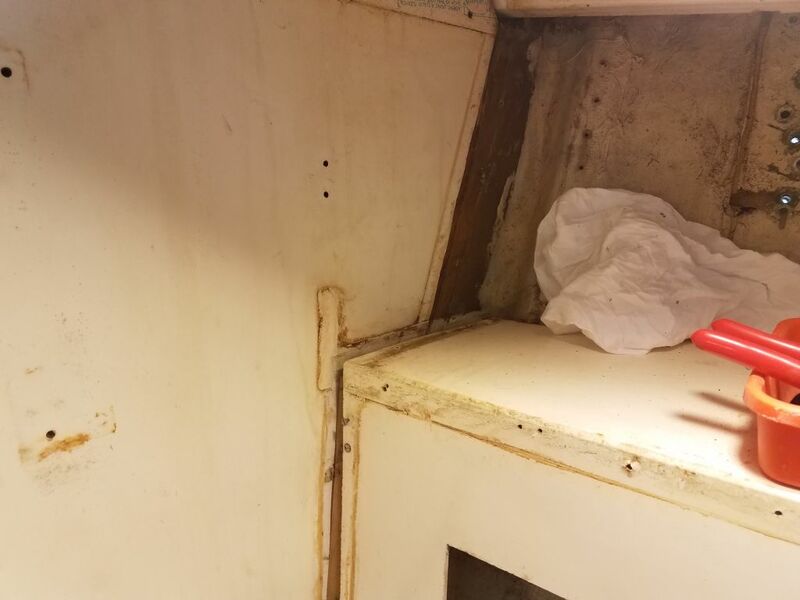 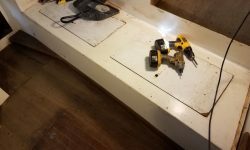 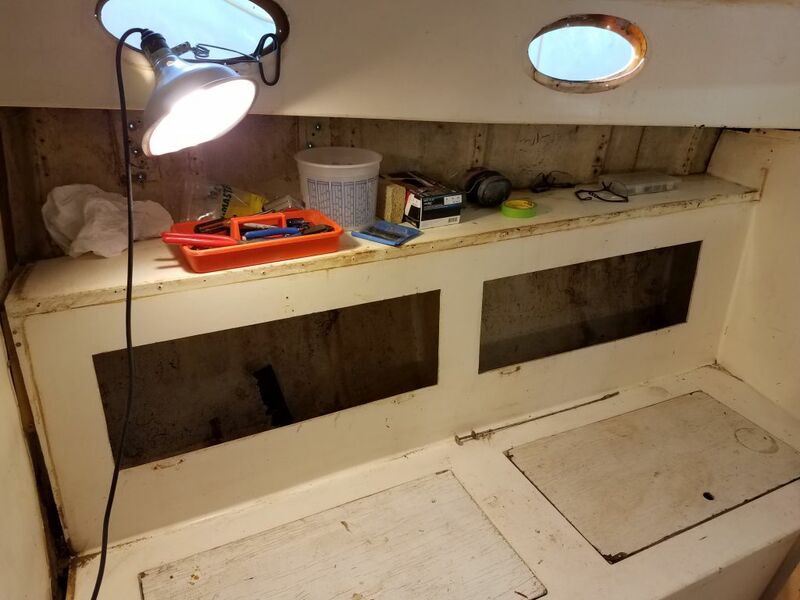 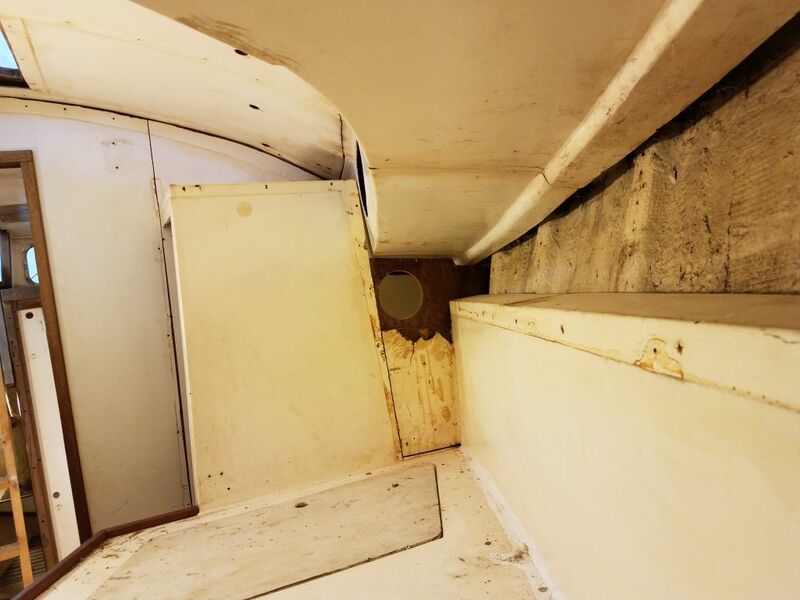 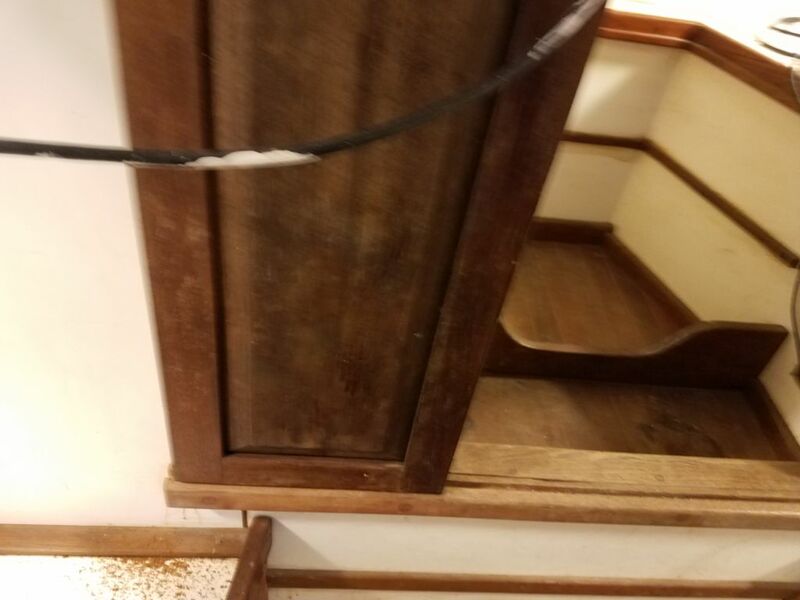 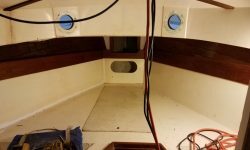 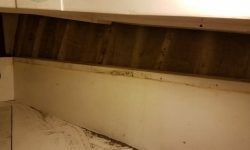 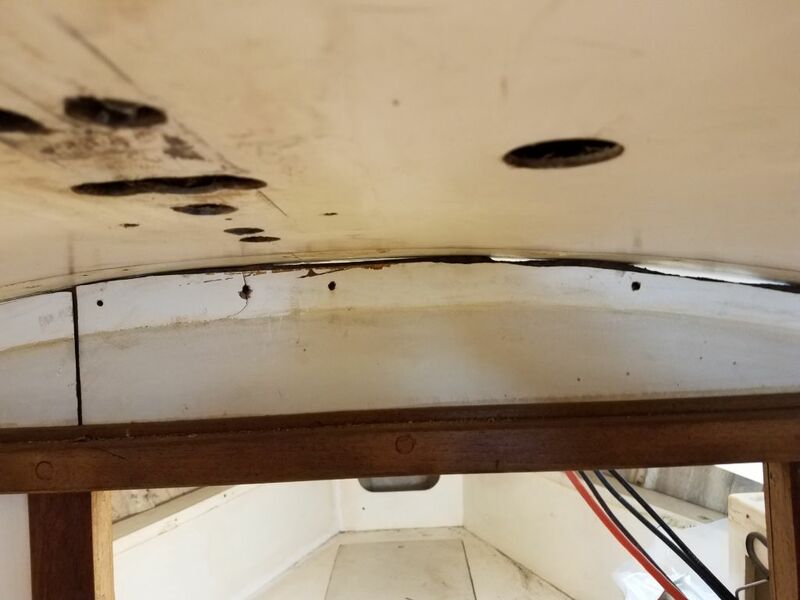 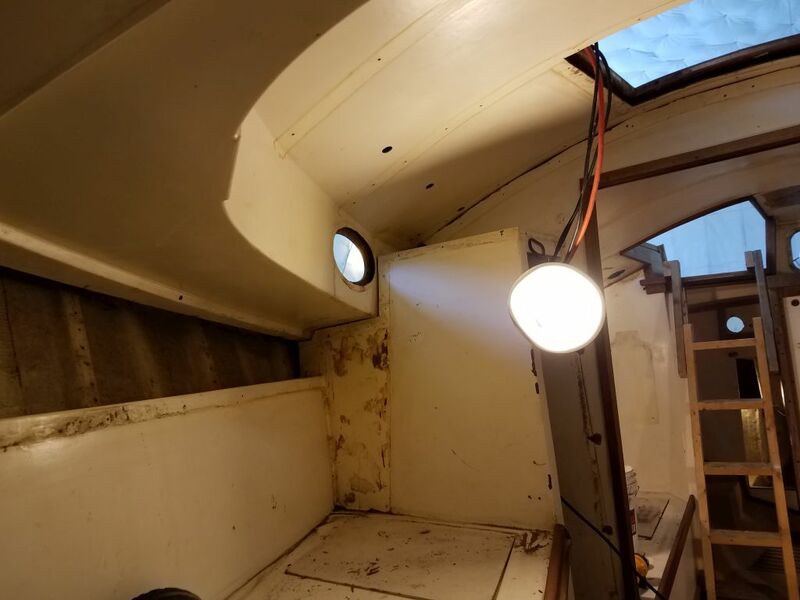 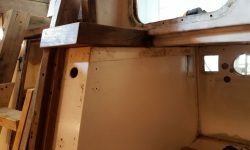 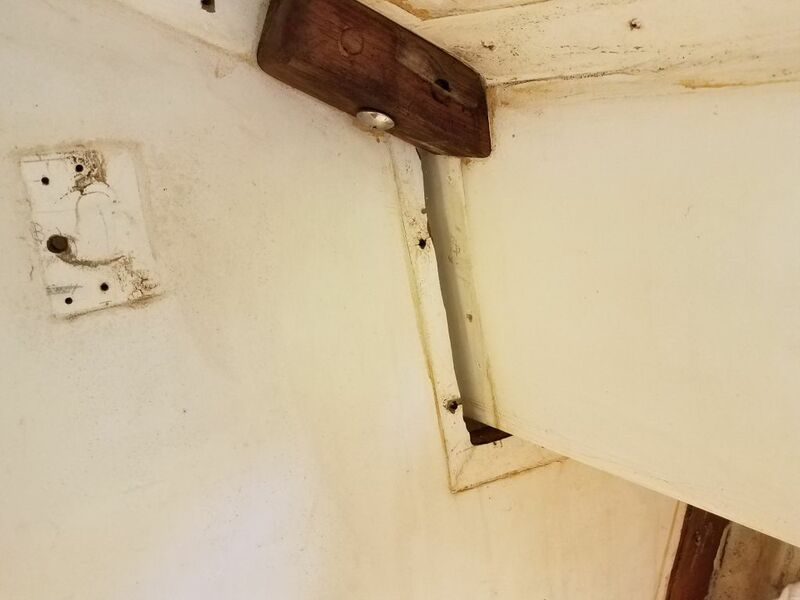 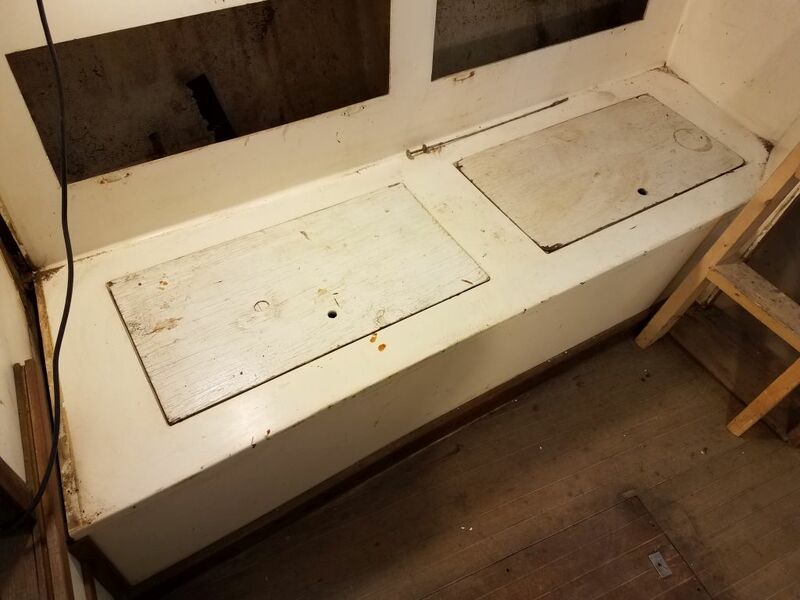 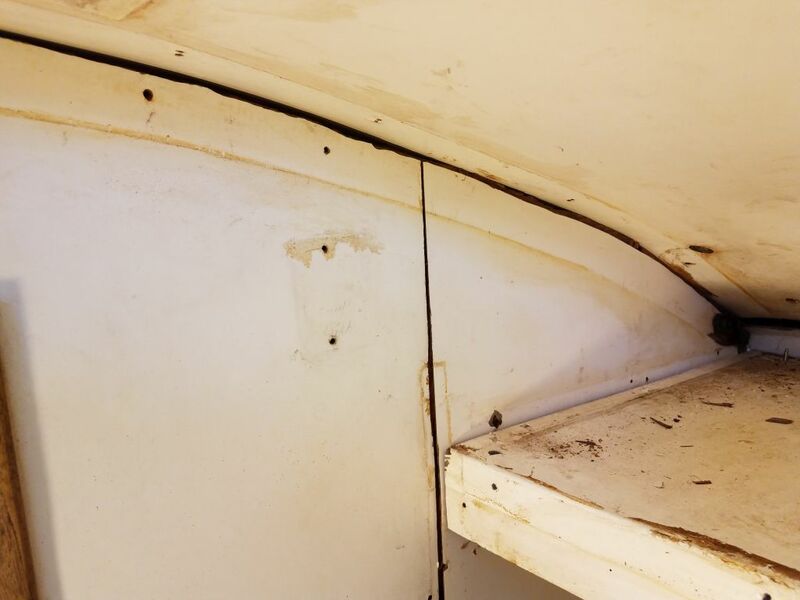 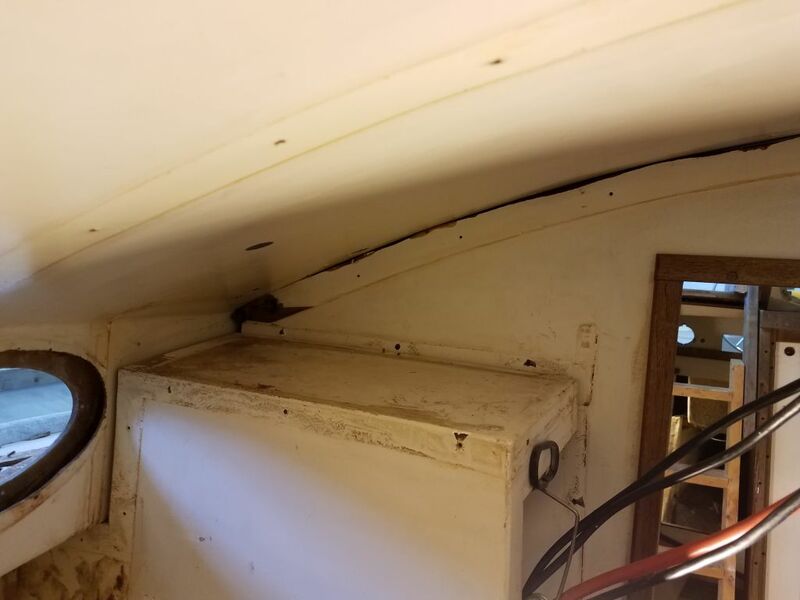 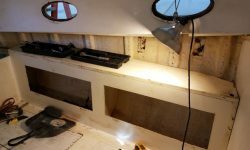 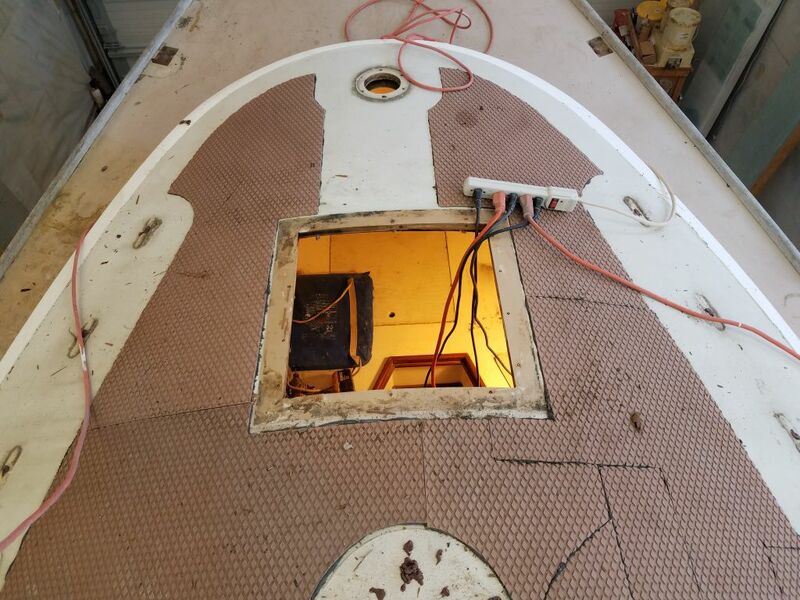 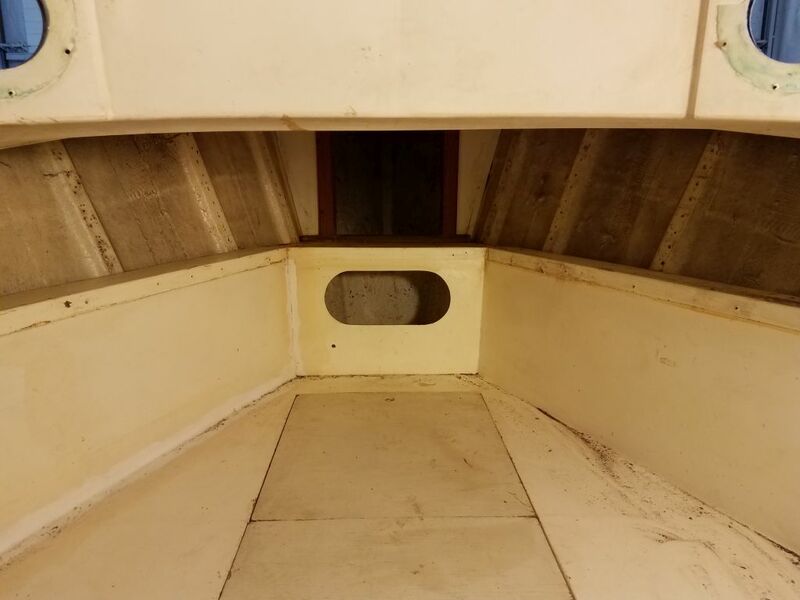 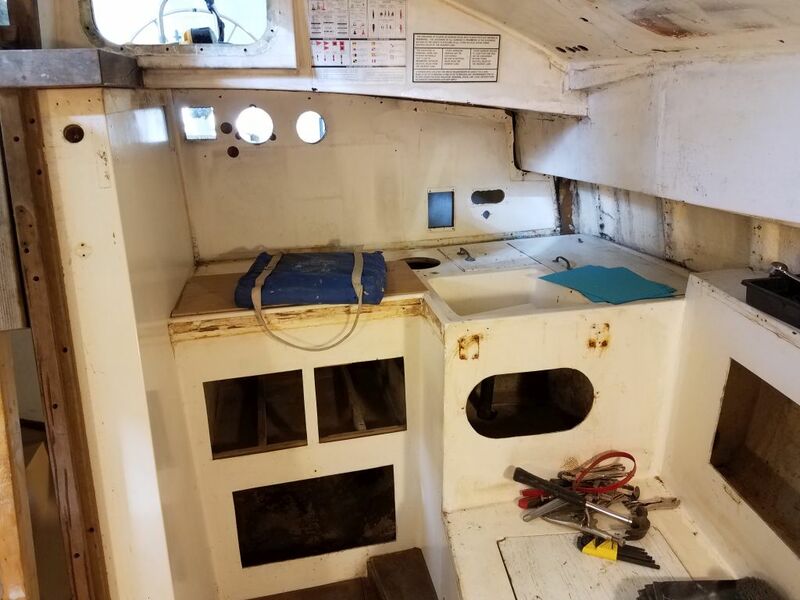 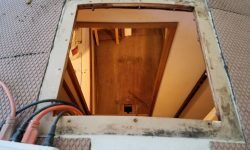 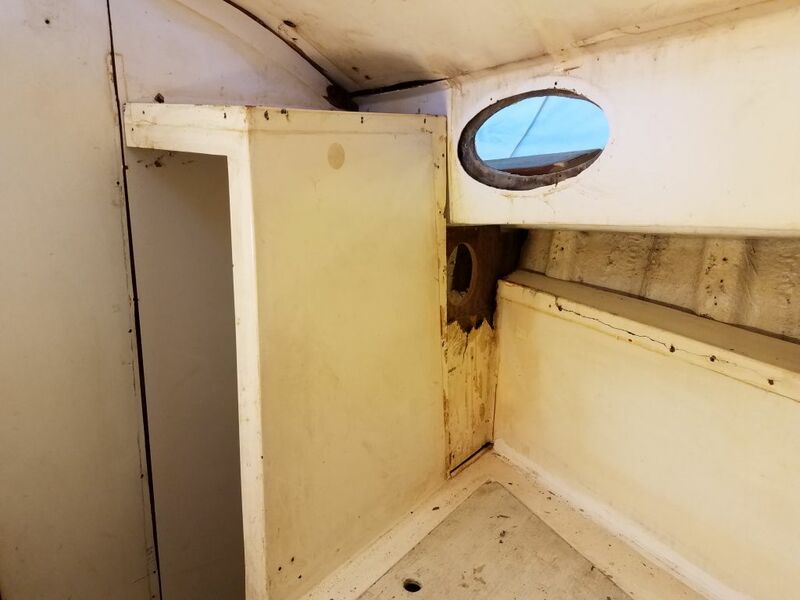 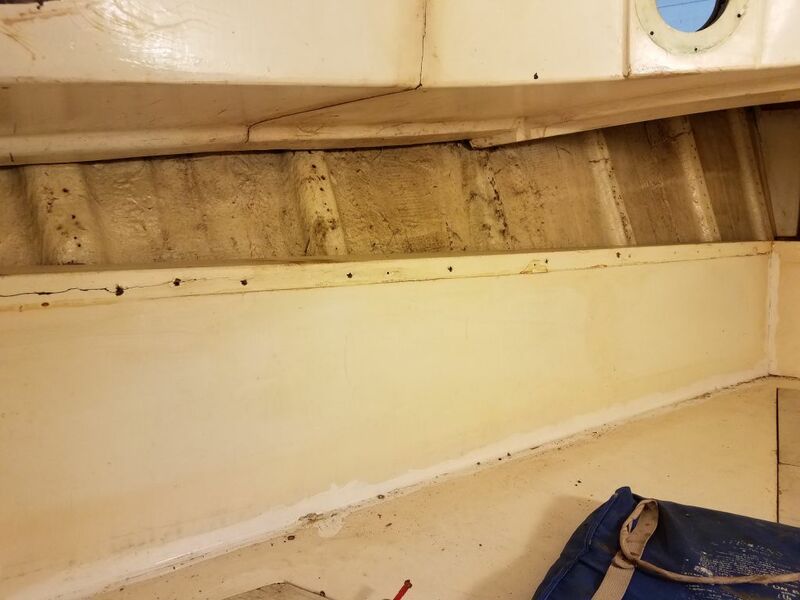 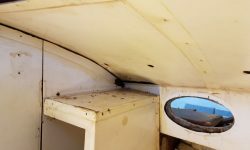 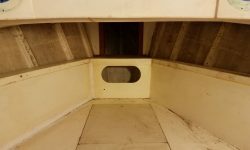 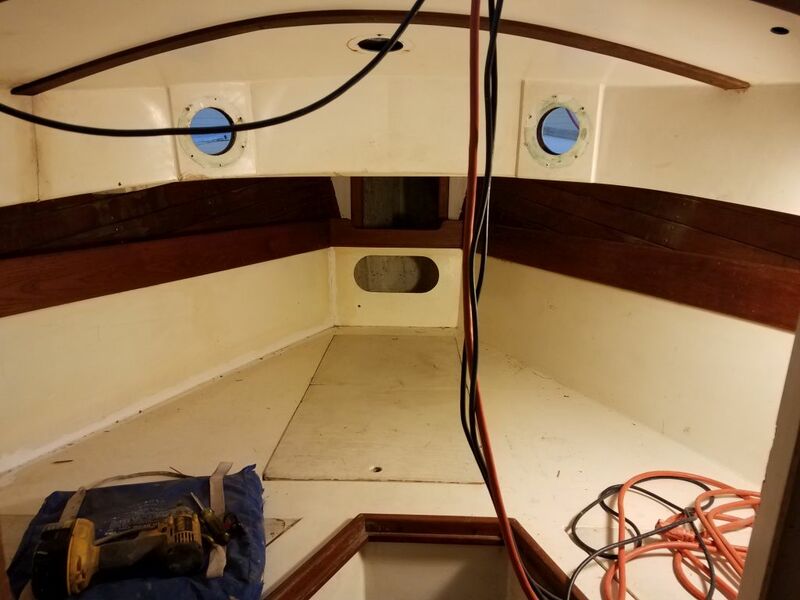 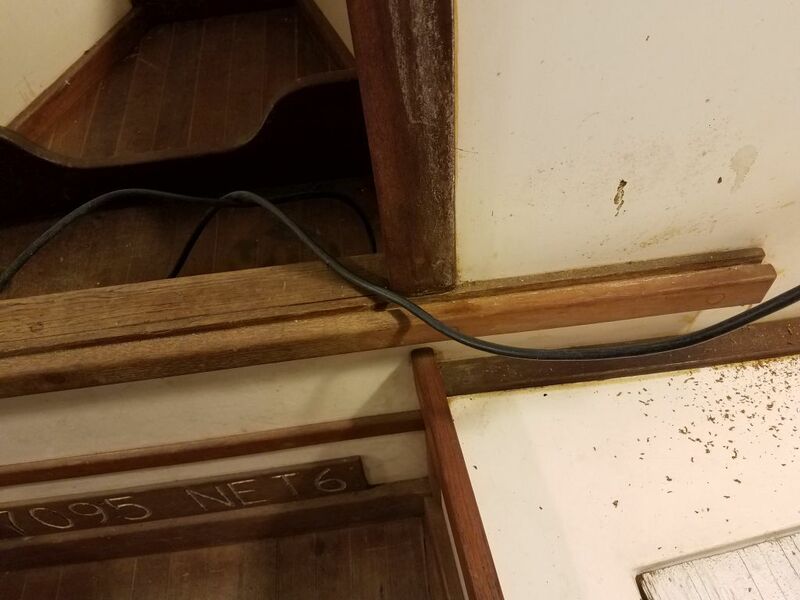 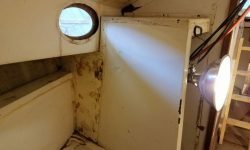 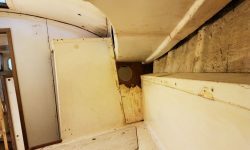 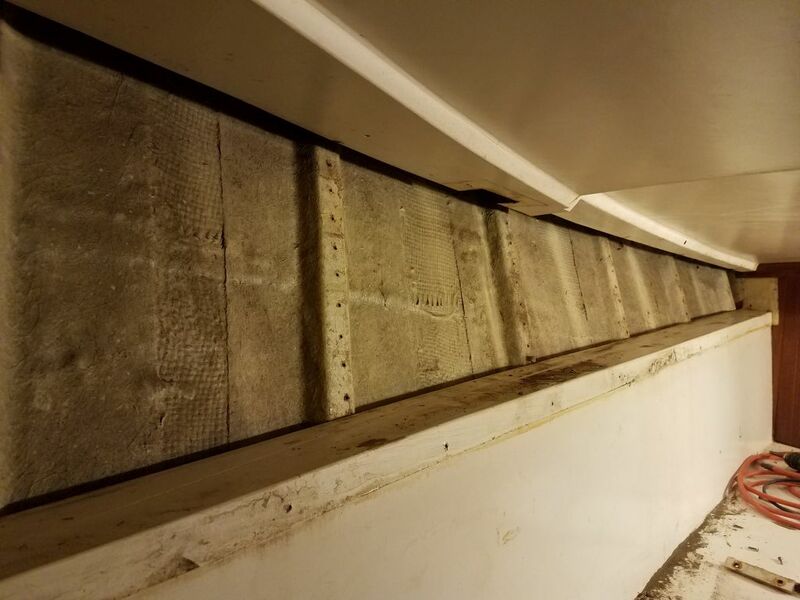 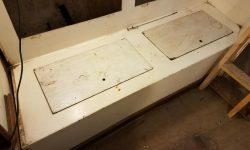 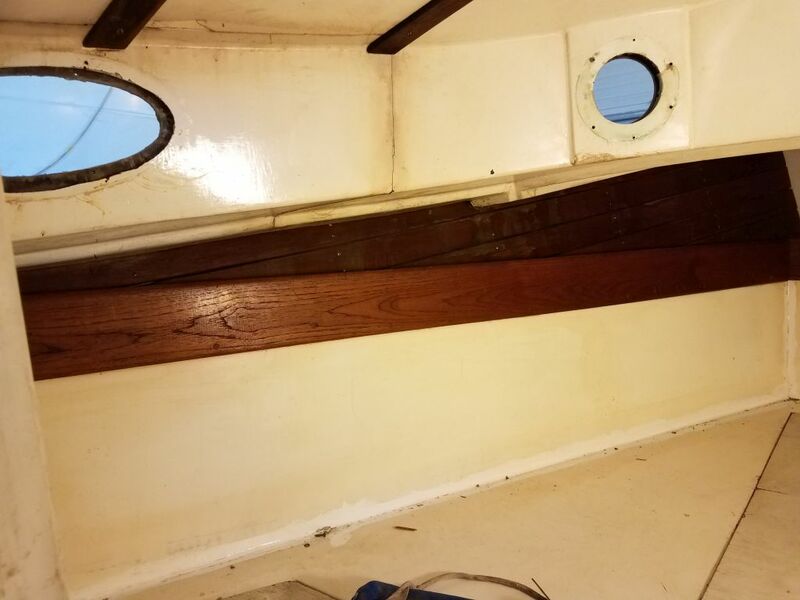 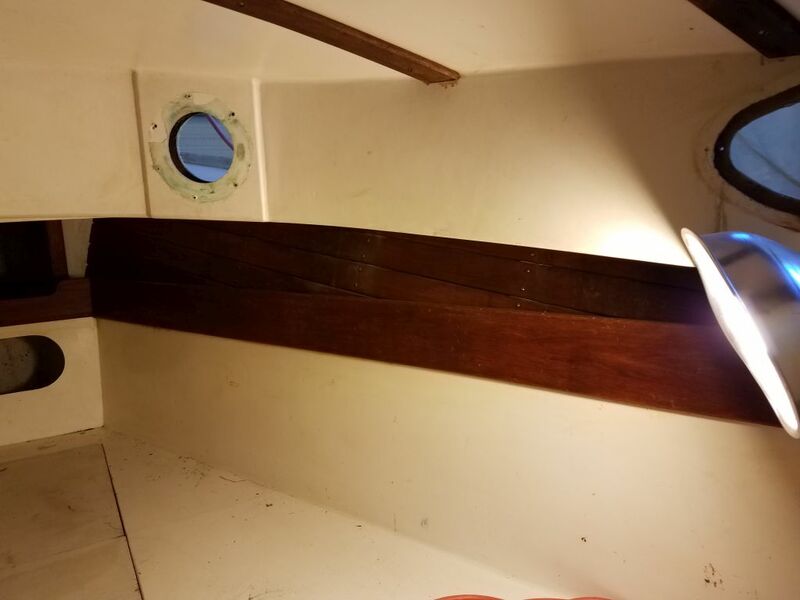 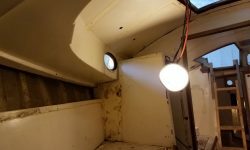 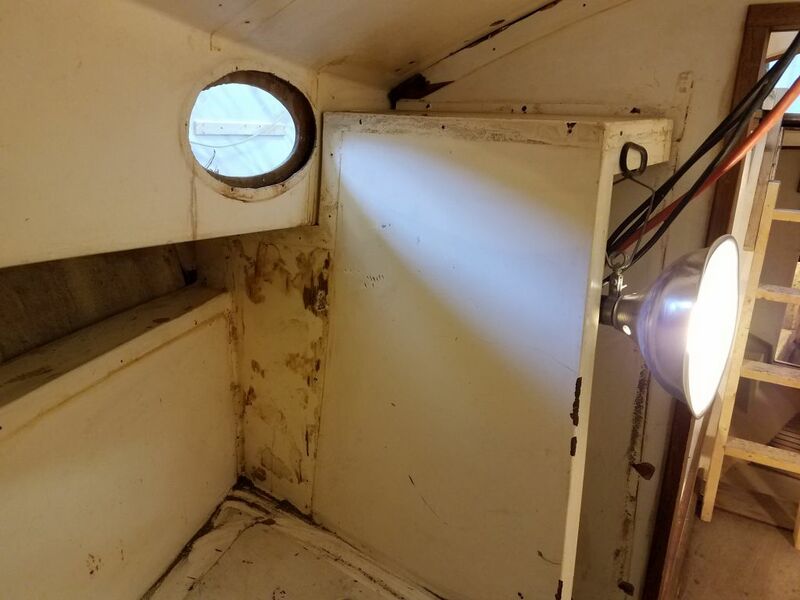 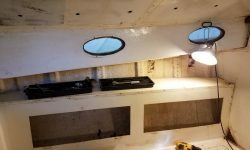 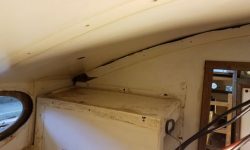 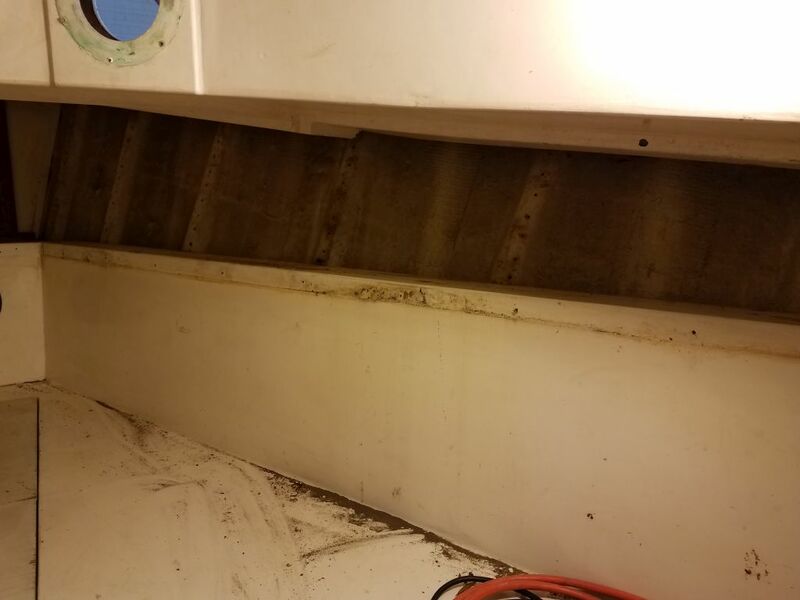 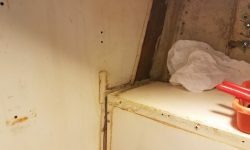 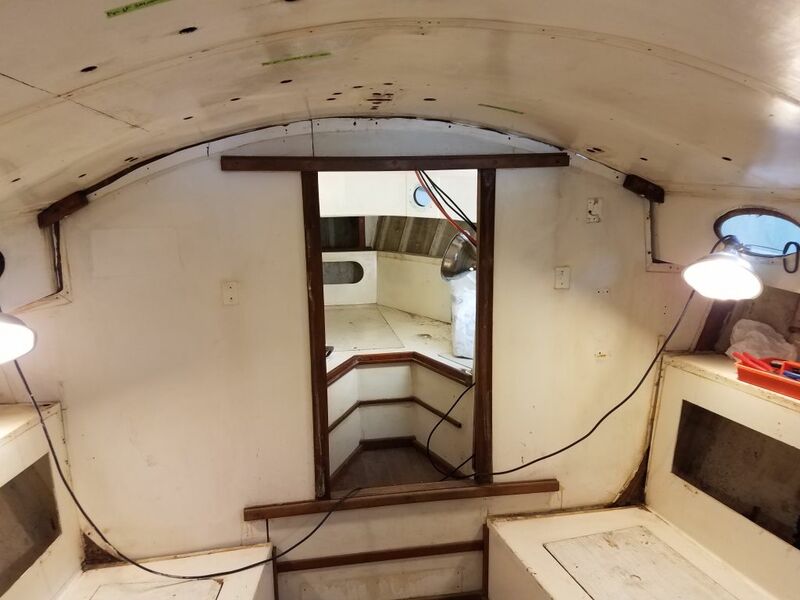 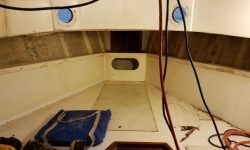 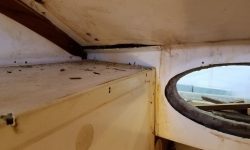 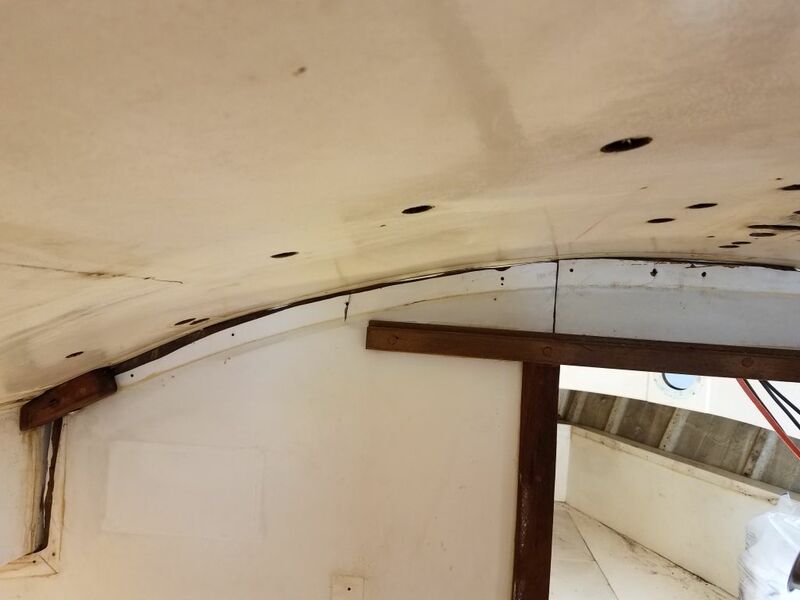 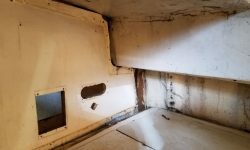 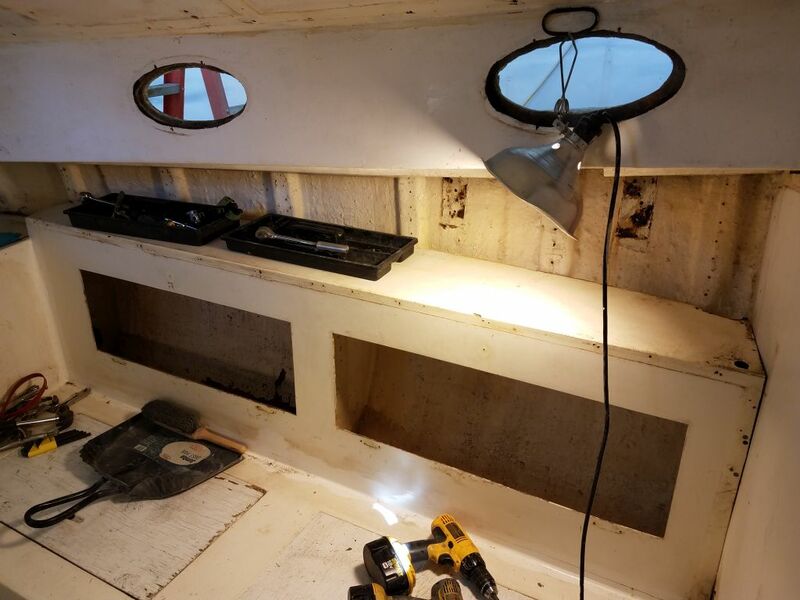 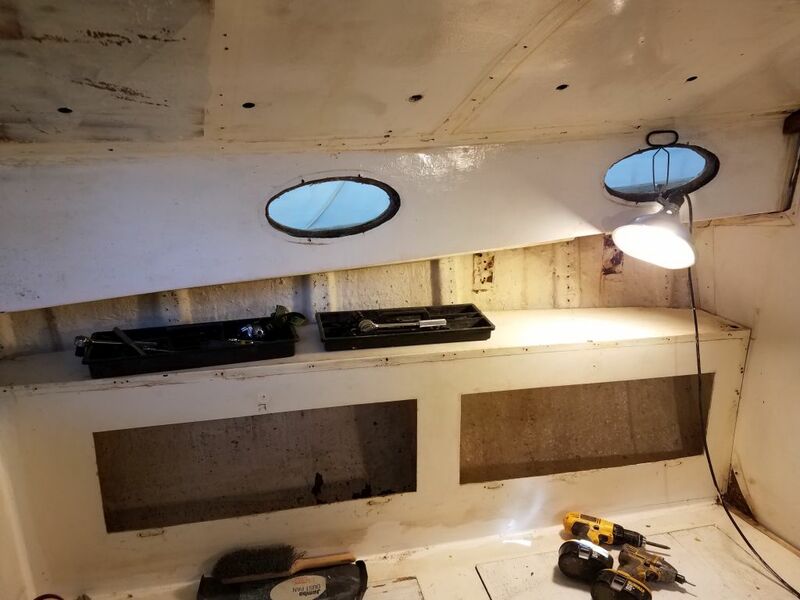 At the after end of the space, I removed the trim from inside the forward hatch (which was to be replaced with a new, modern deck hatch), and removed all the trim from around the aft end of the berths and hanging lockers. 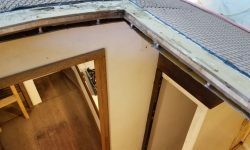 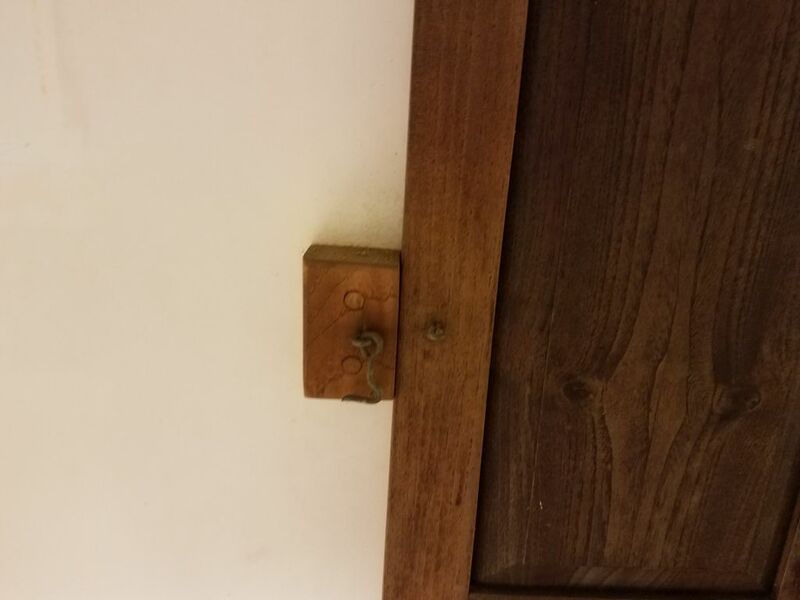 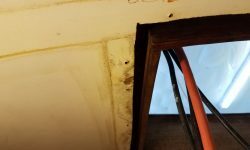 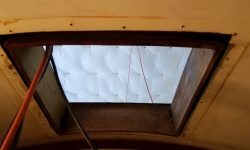 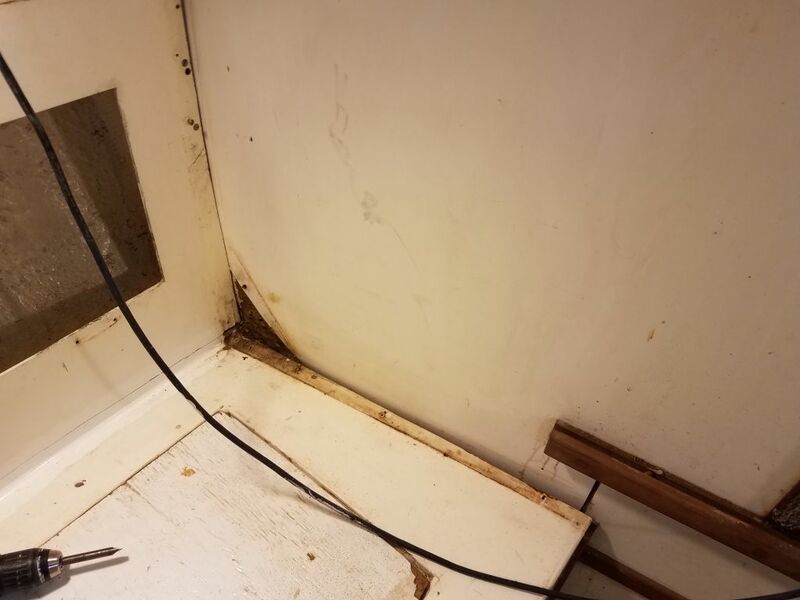 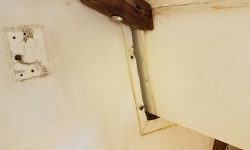 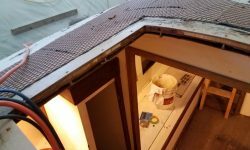 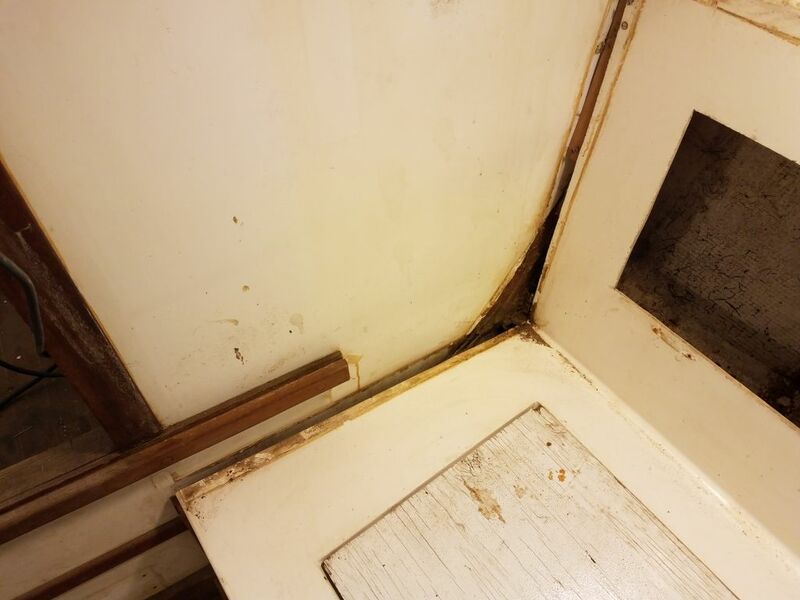 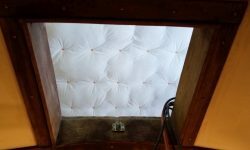 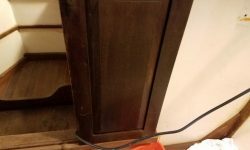 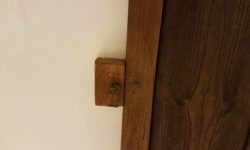 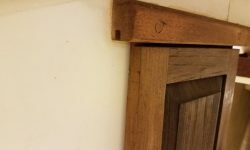 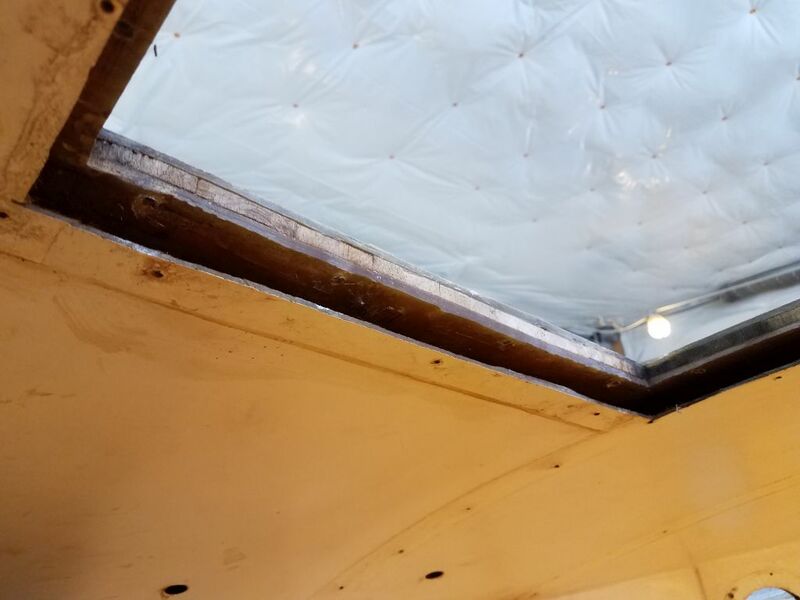 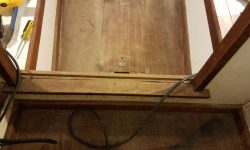 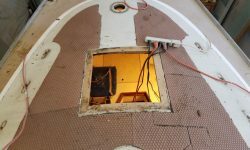 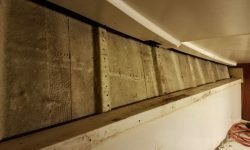 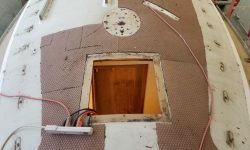 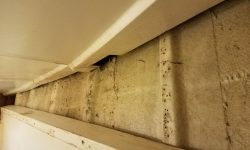 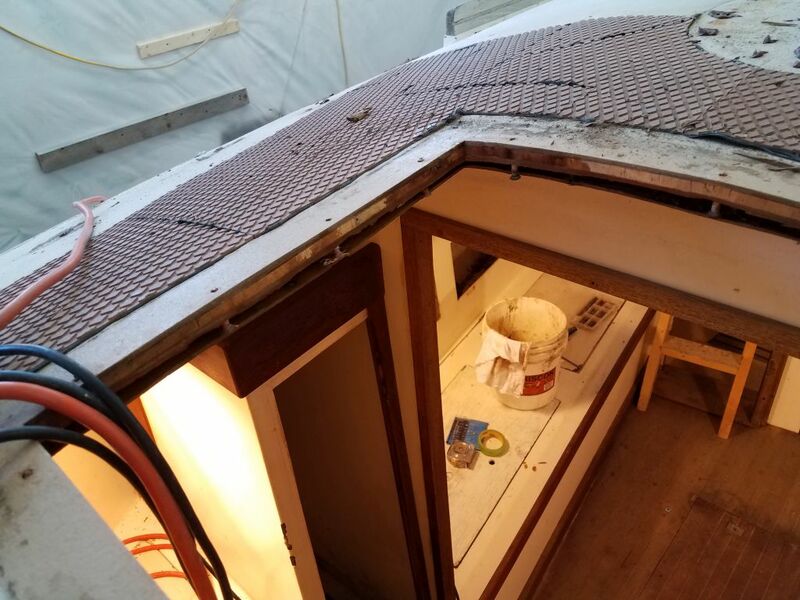 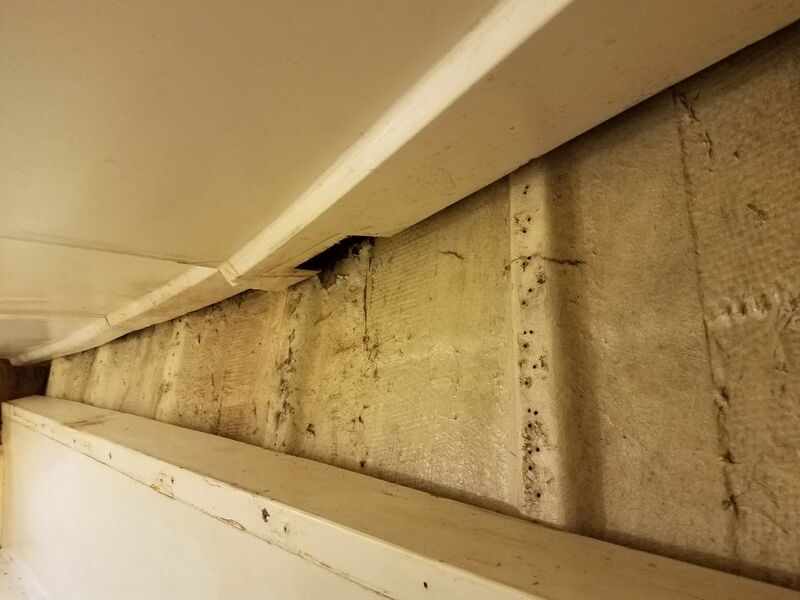 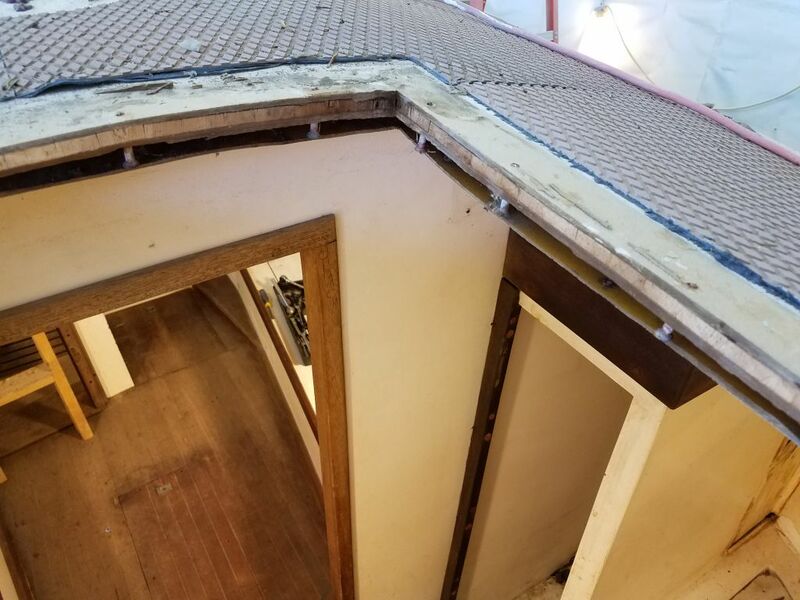 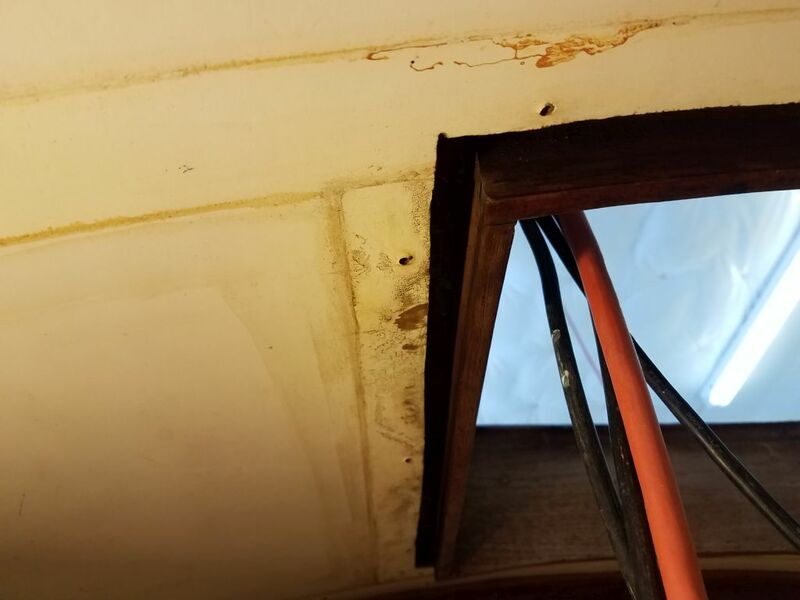 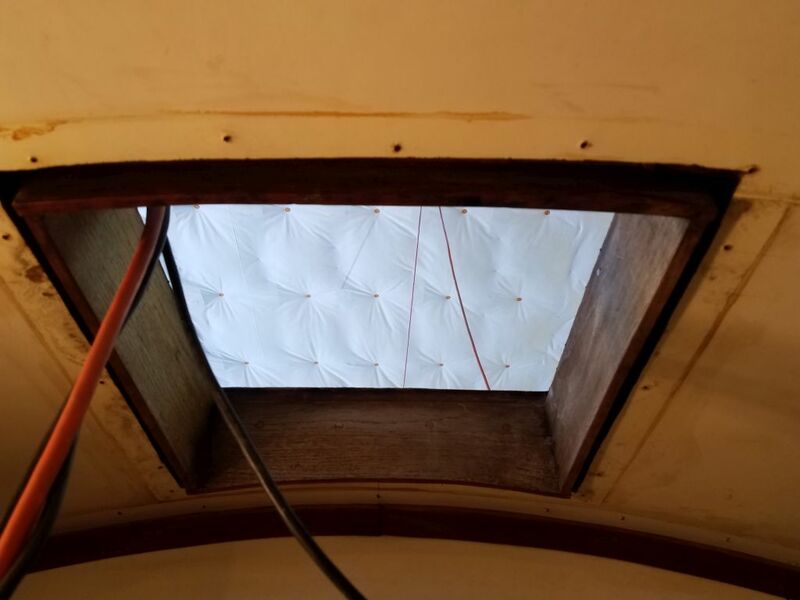 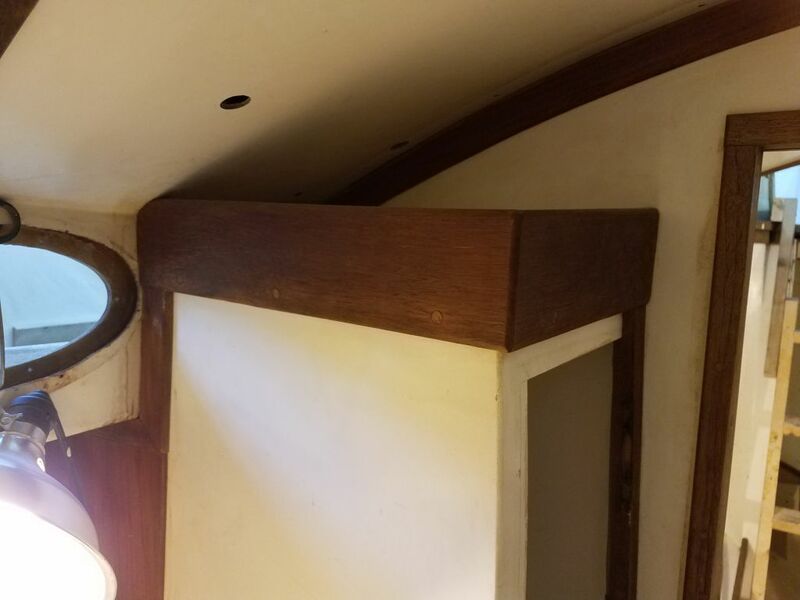 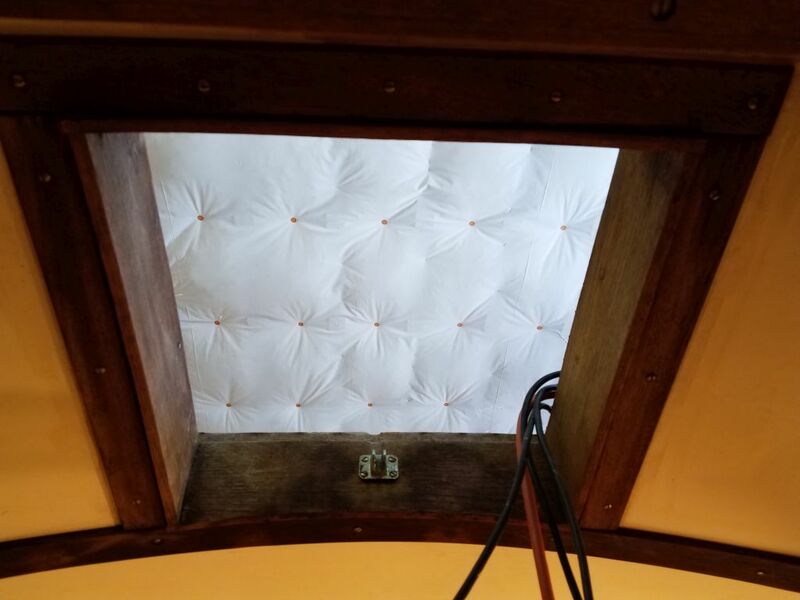 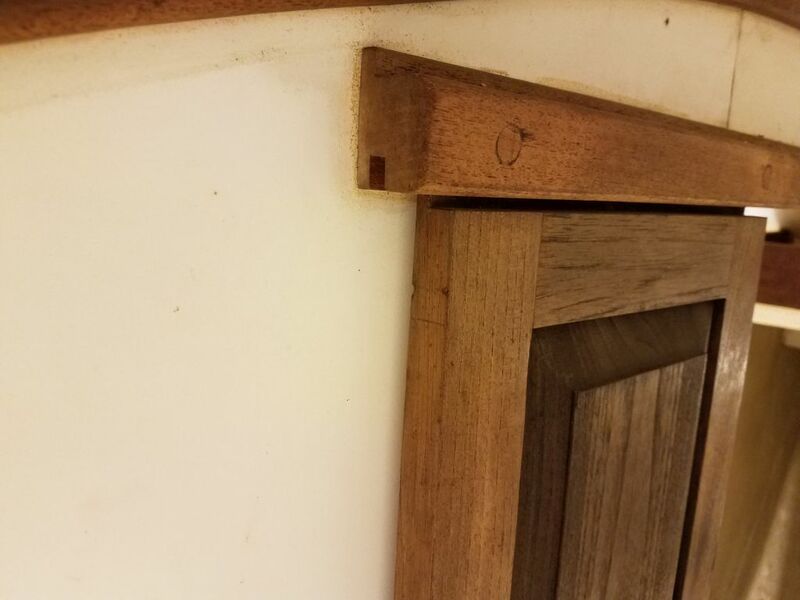 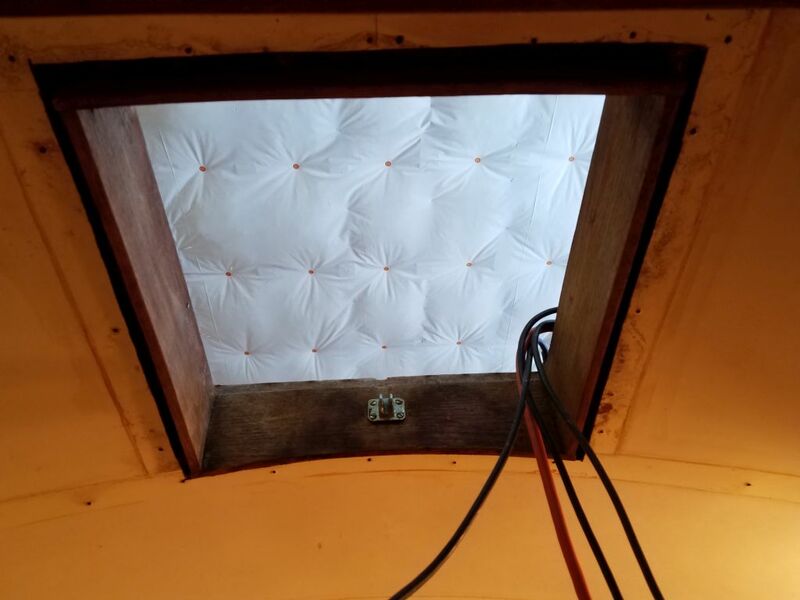 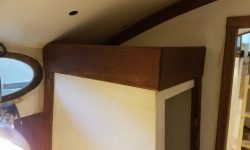 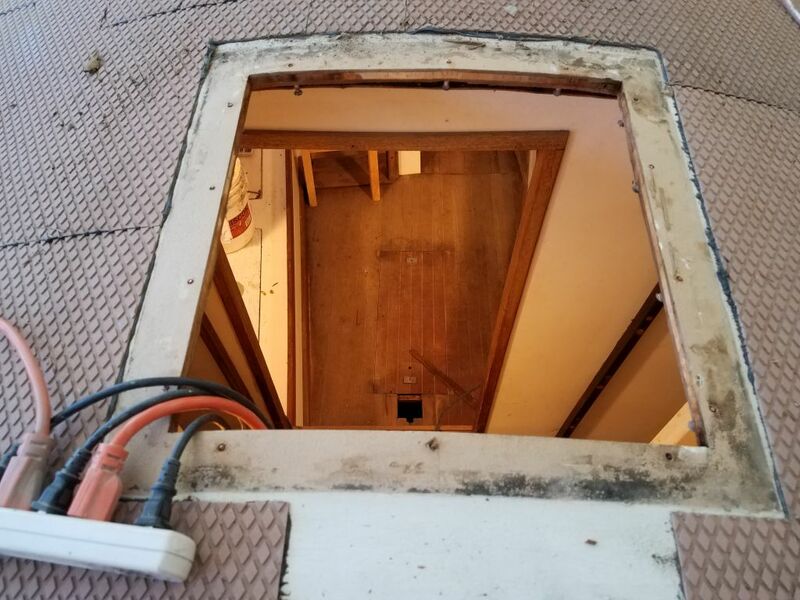 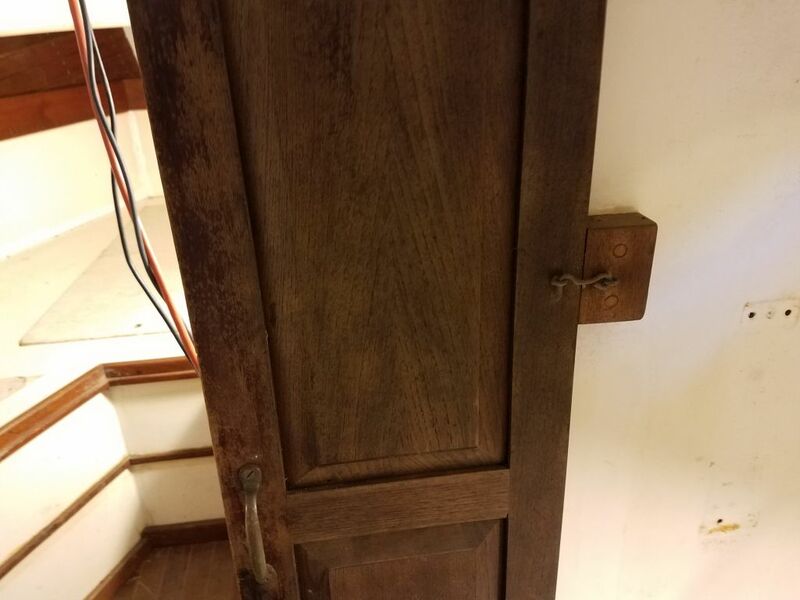 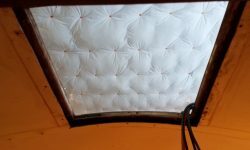 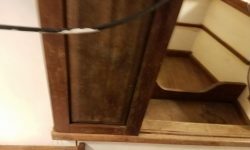 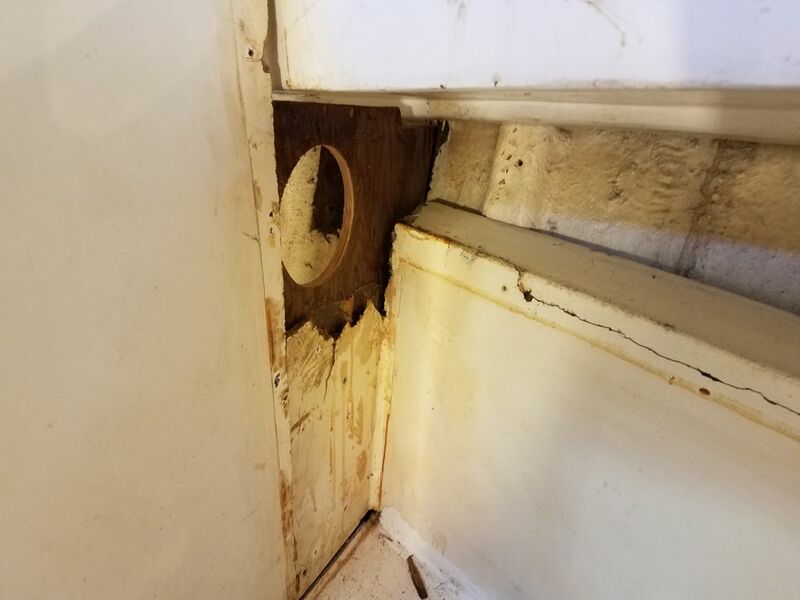 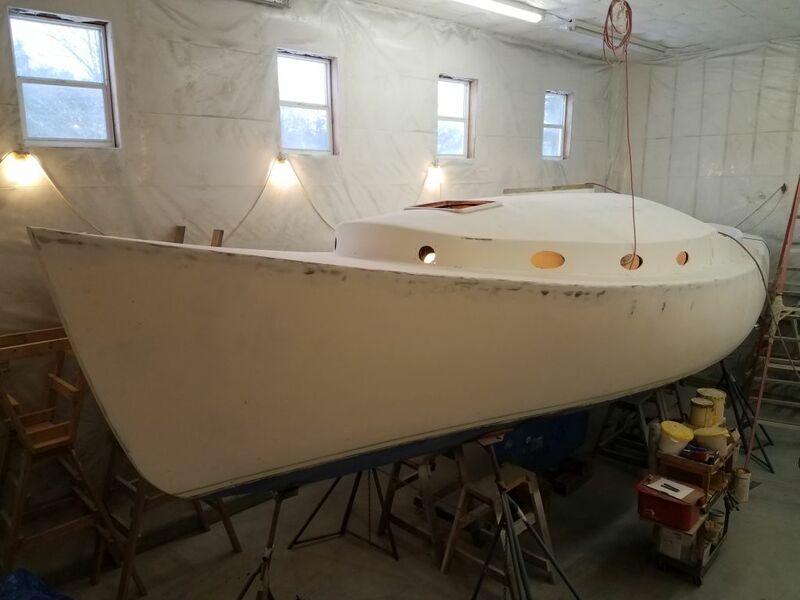 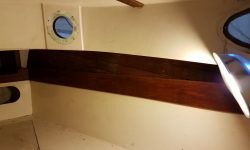 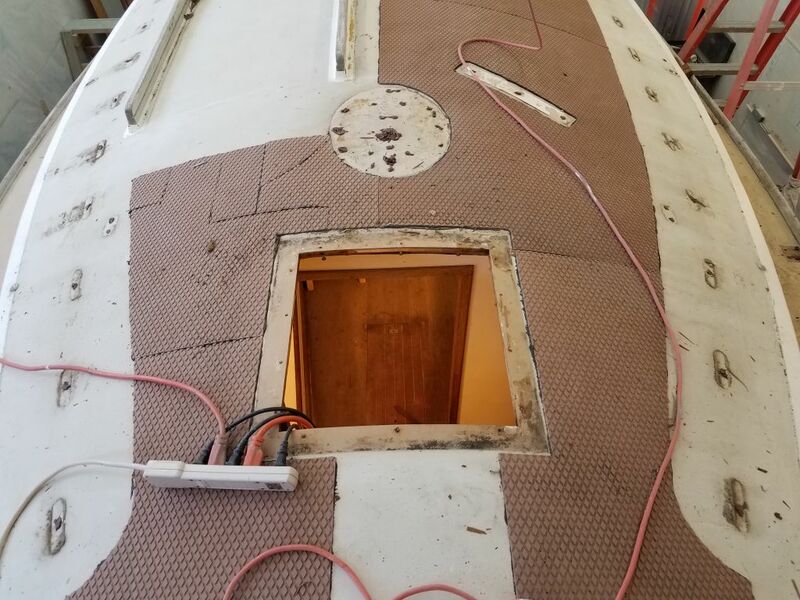 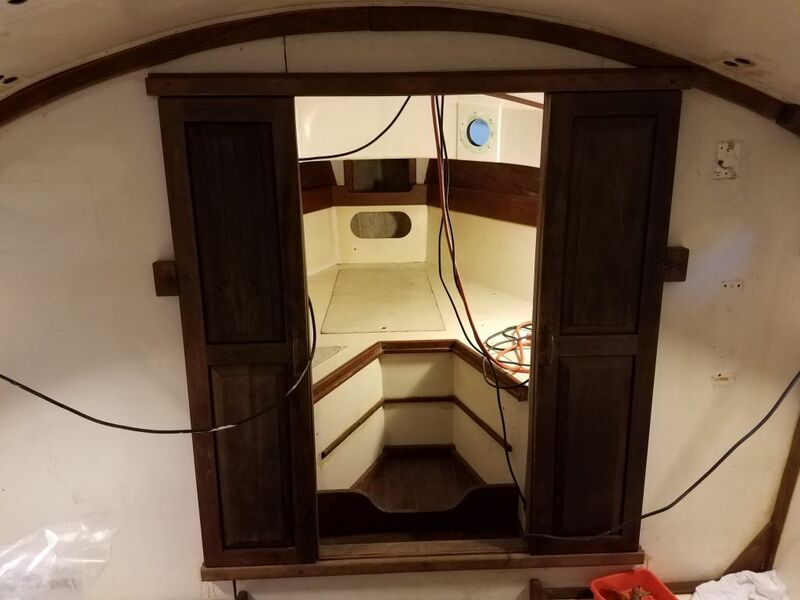 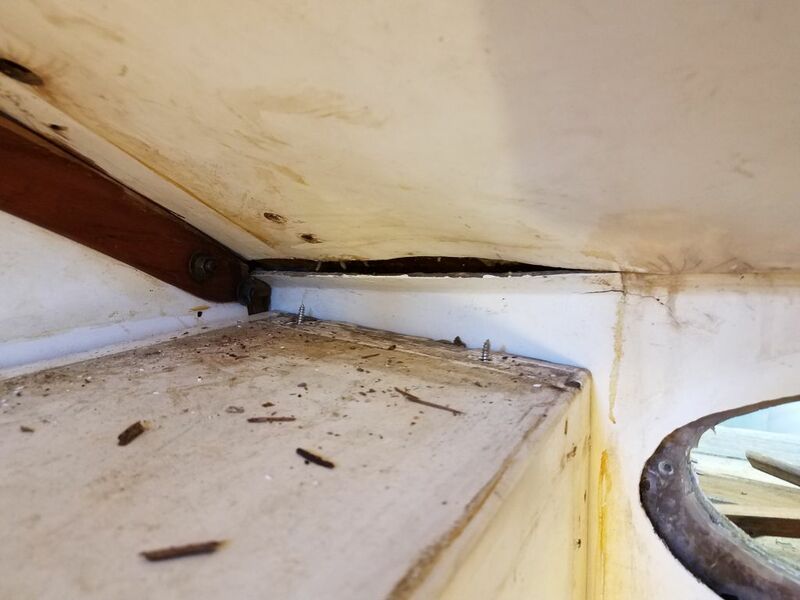 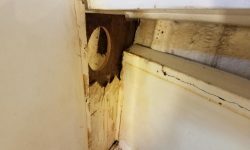 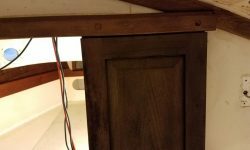 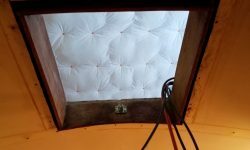 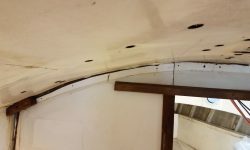 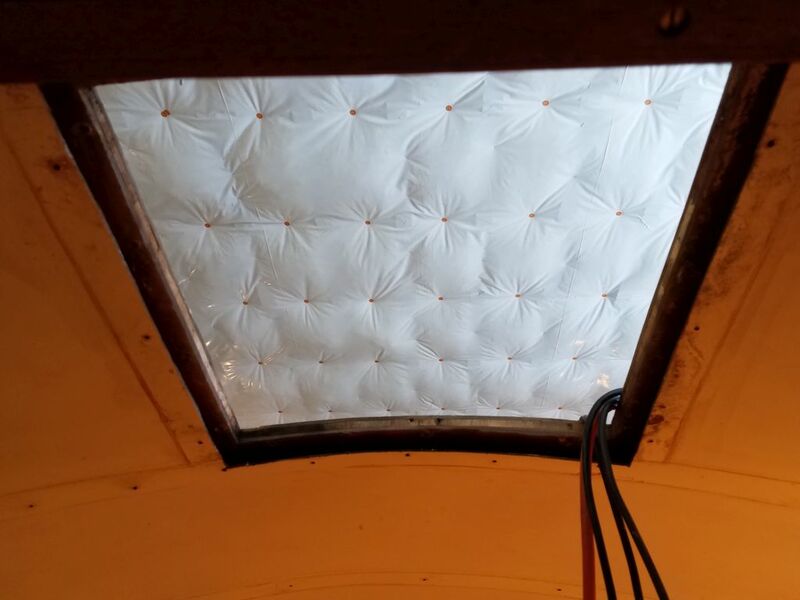 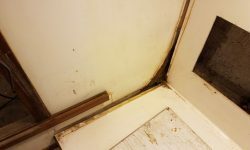 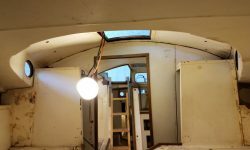 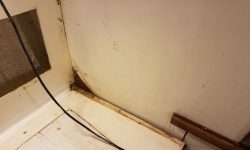 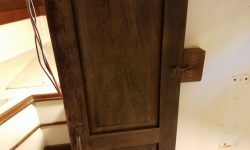 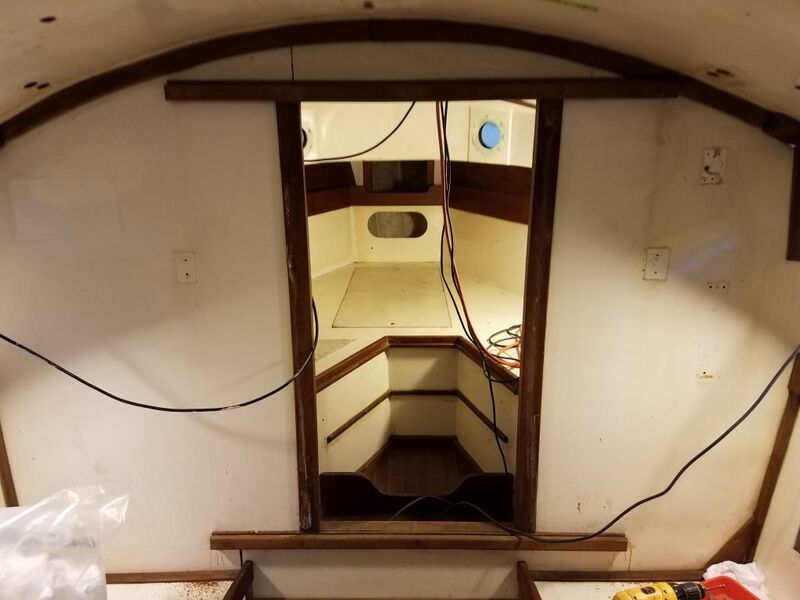 The plywood main bulkhead was covered with high pressure laminate, which seemed largely loose and, once I removed some final trim around the large door to the space, looked to be relatively easily removable. 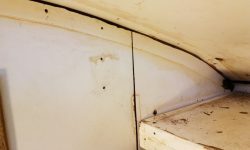 This would be required since the existing surface was in poor condition and not worthy of re-use. 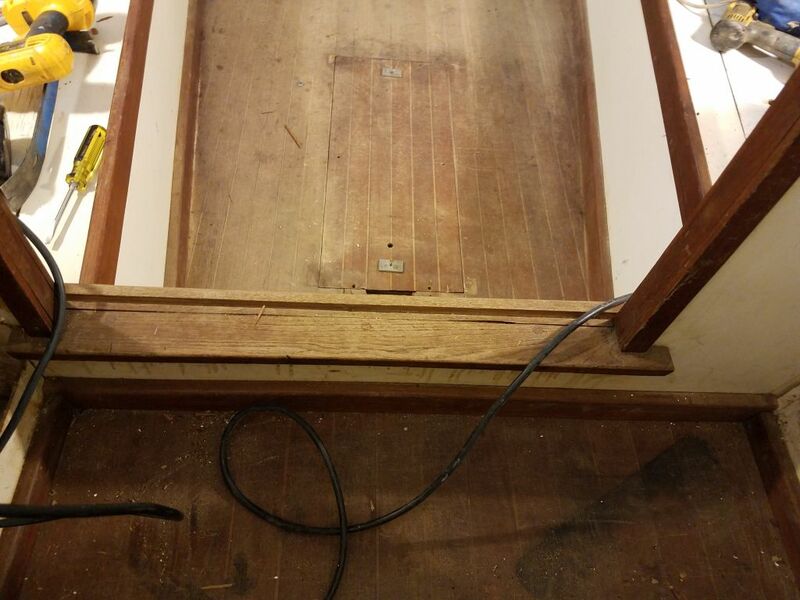 Later, on deck, I removed the forward hatch trim, leaving the raw opening in the deck. 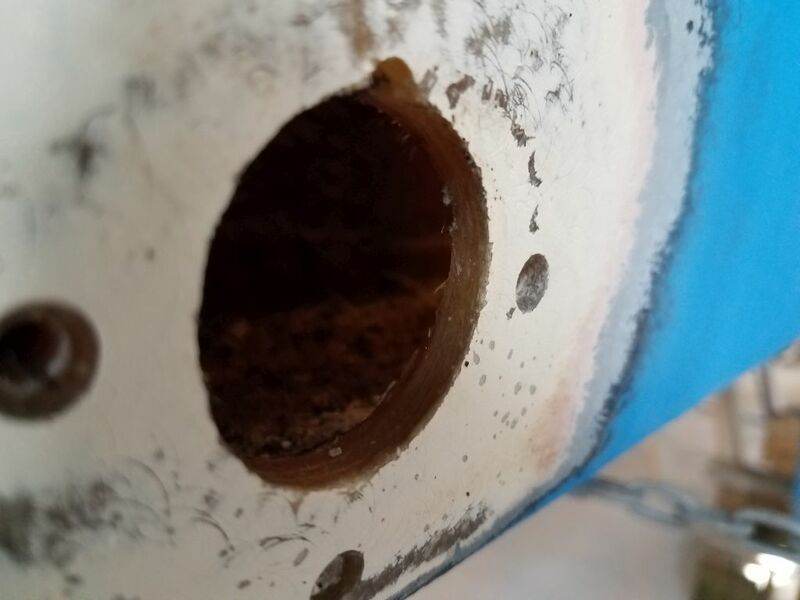 The exposed core in the cutout was in good condition to the extent visible. 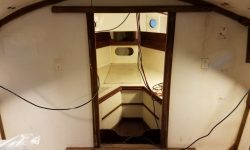 In the main cabin, I removed the two sliding doors from the opening to the forward cabin. 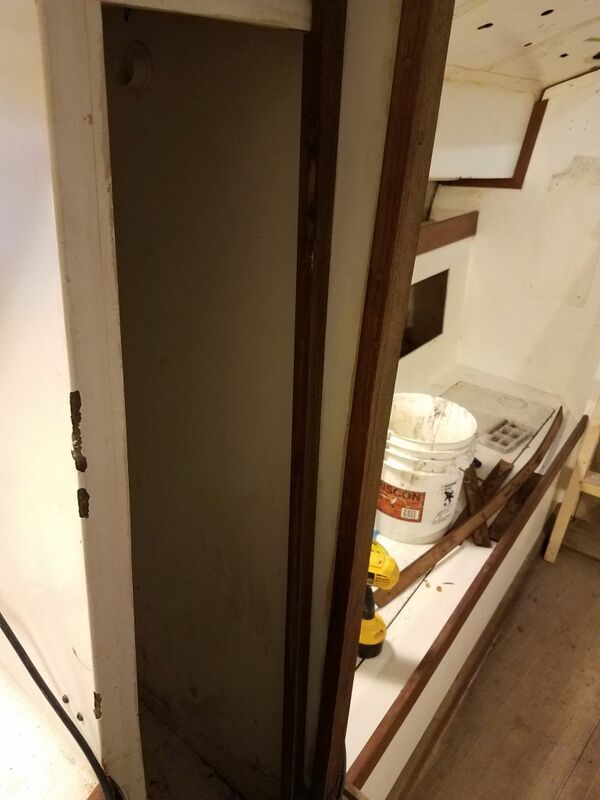 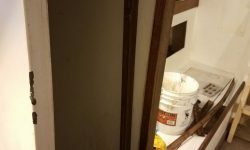 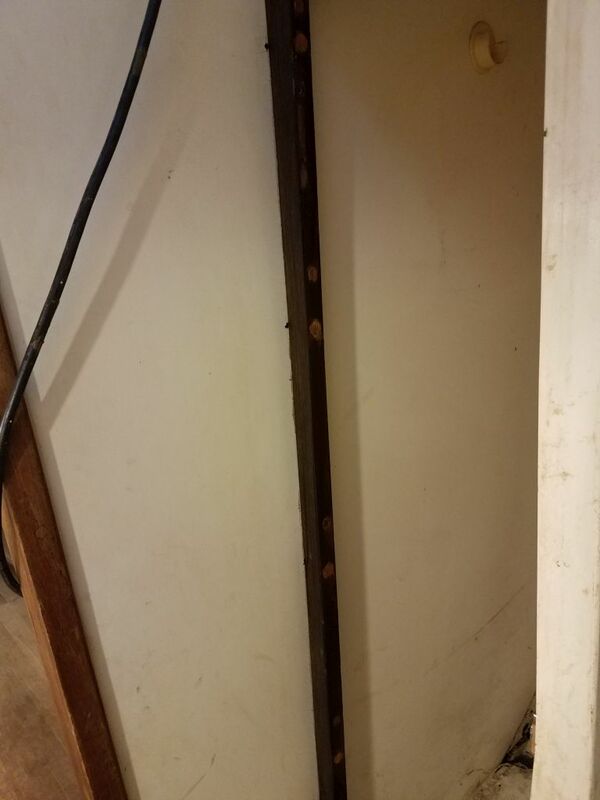 I’d remove the rest of the door trim in the near future. 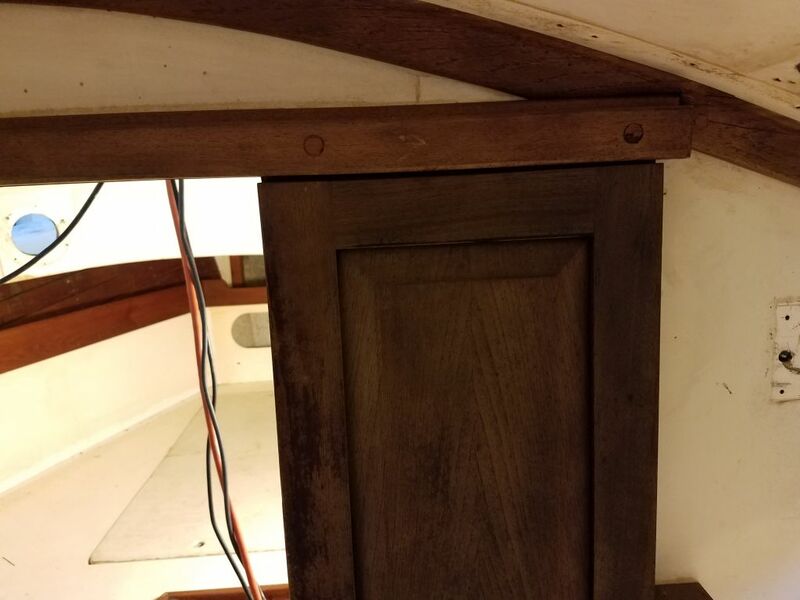 For now, I noted details for future reconstruction. 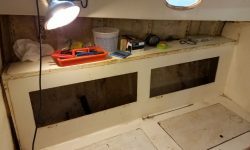 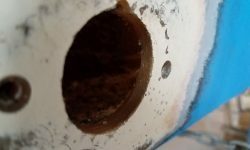 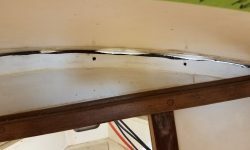 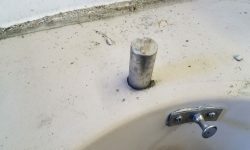 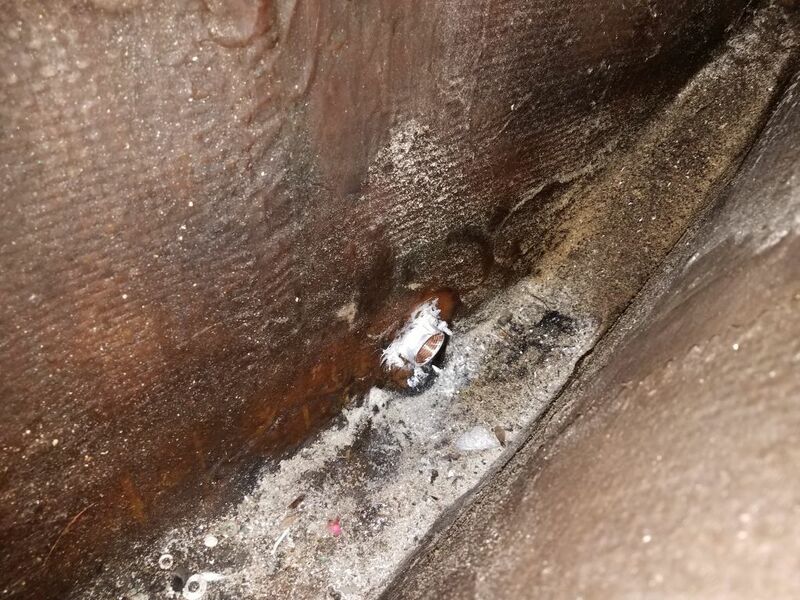 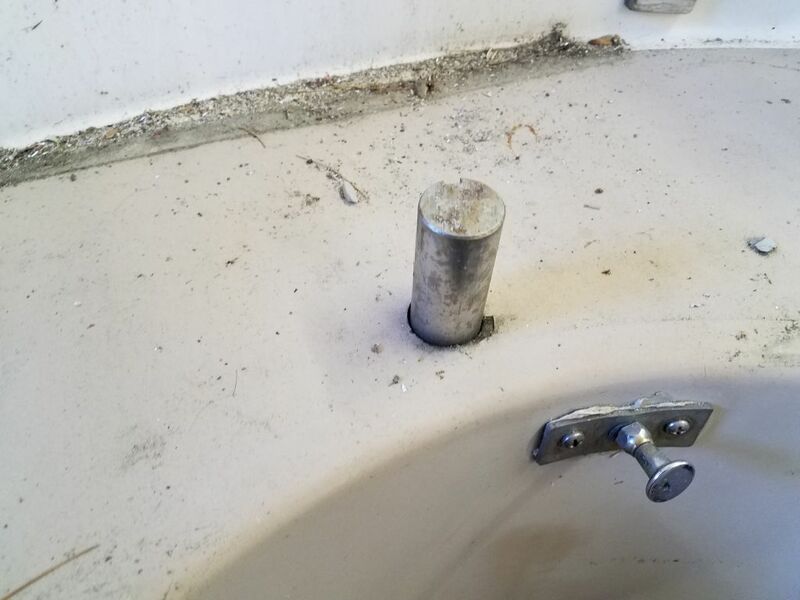 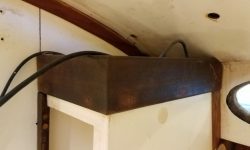 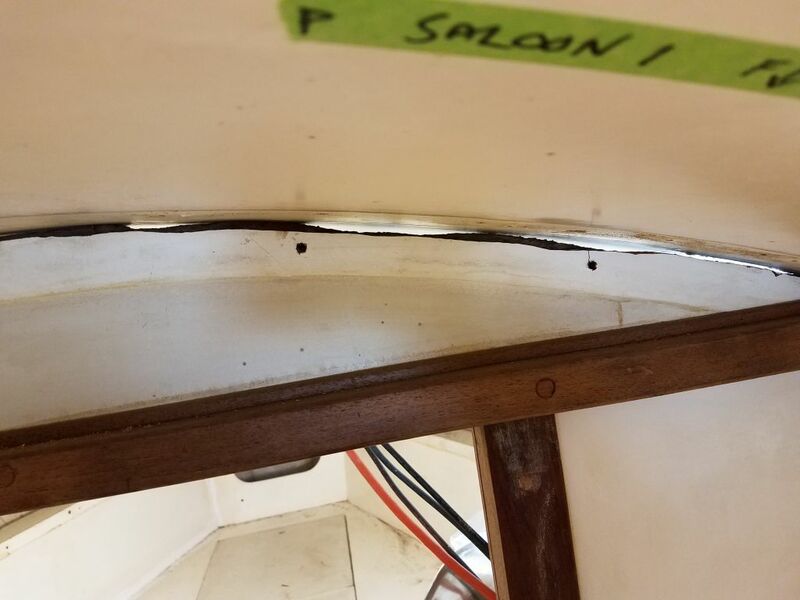 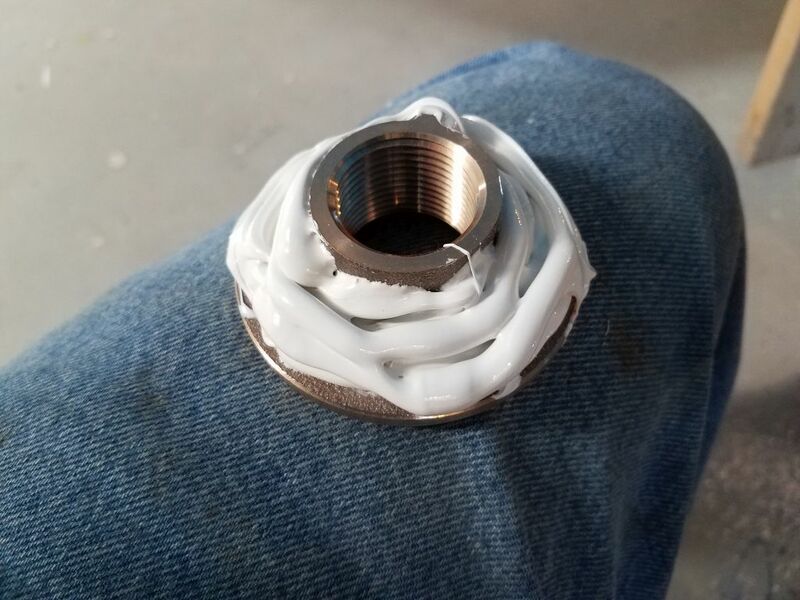 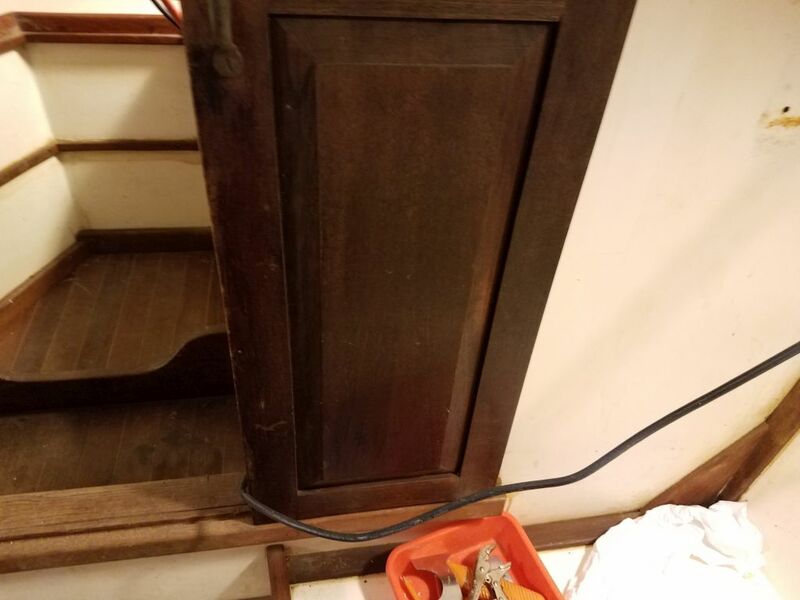 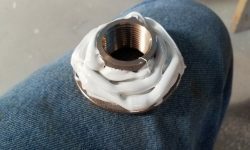 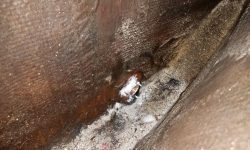 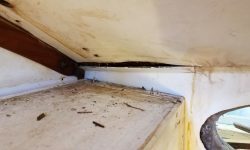 In mid-afternoon, the new bronze garboard drain I’d ordered arrived, and I spent a few minutes installing it right away, to give the sealant time to cure and so I could move on with the full-soak bilge cleaning later in the week. 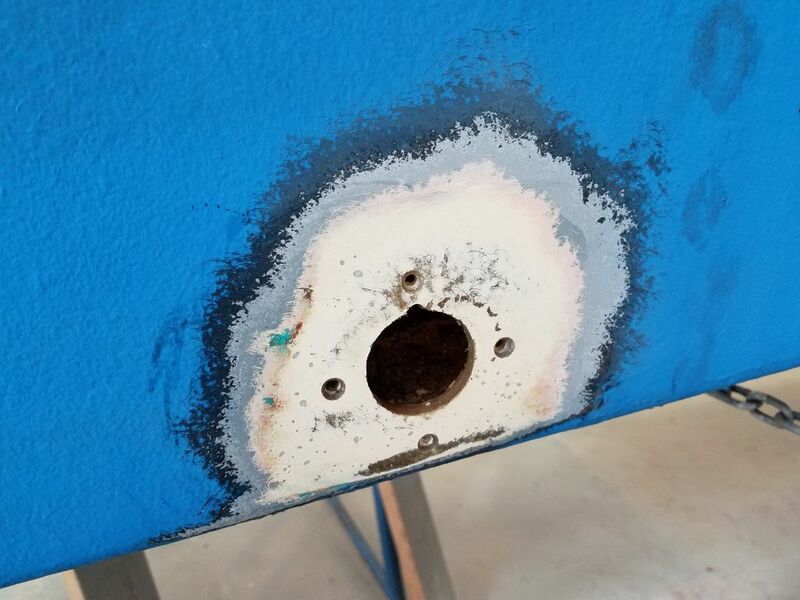 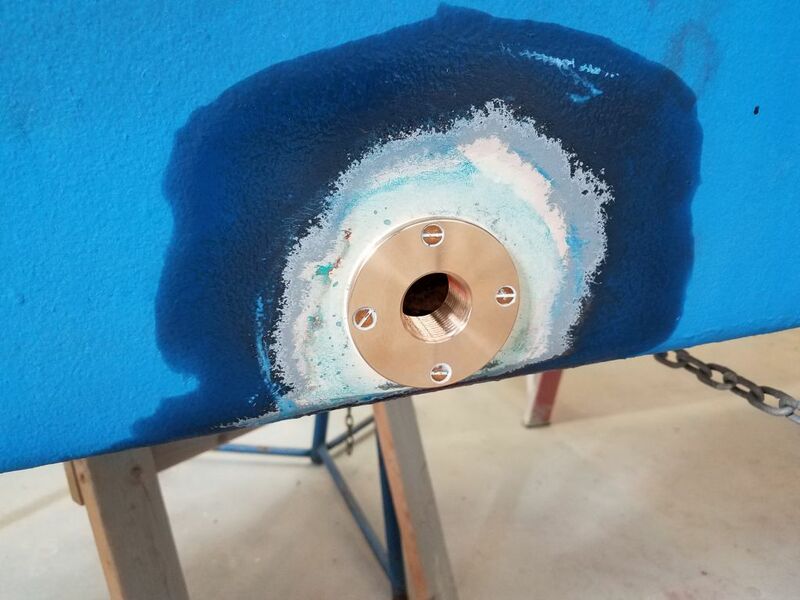 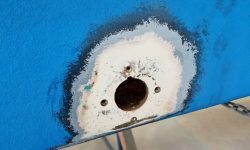 After removing the bottom paint and other coatings from the area, I expanded the small drain hole I’d created earlier, keeping the new hole as low as I could, then prepared fastener holes, drilling and tapping for #10 machine screws. 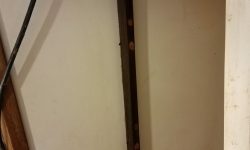 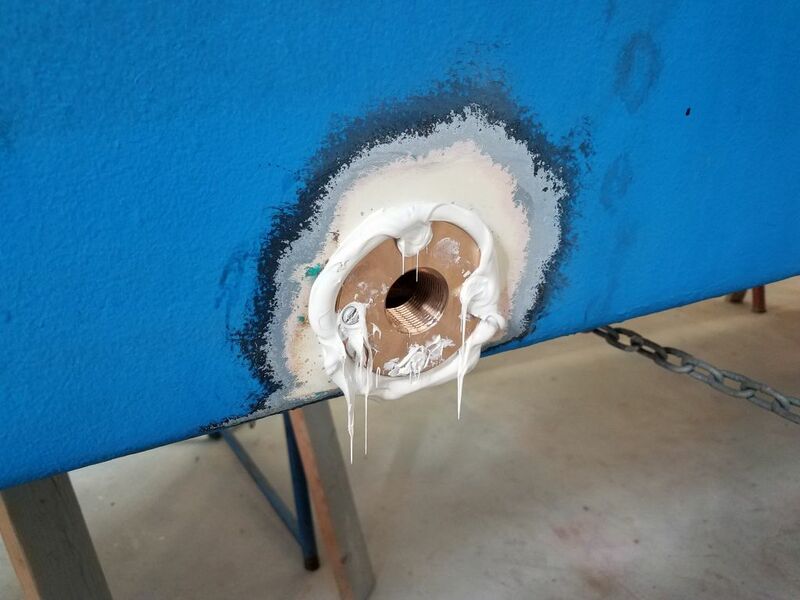 Then I installed the new fitting with plenty of polyurethane sealant (4200), securing it with four bronze screws. 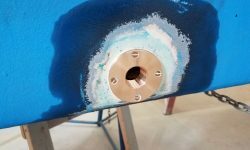 Inside, since I had access, I added nuts to the insides of the screws. 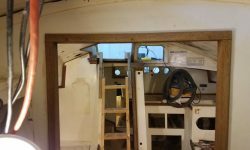 I spent the remainder of the day removing most of the trim in the main cabin, including bulkhead trim and fiddles.